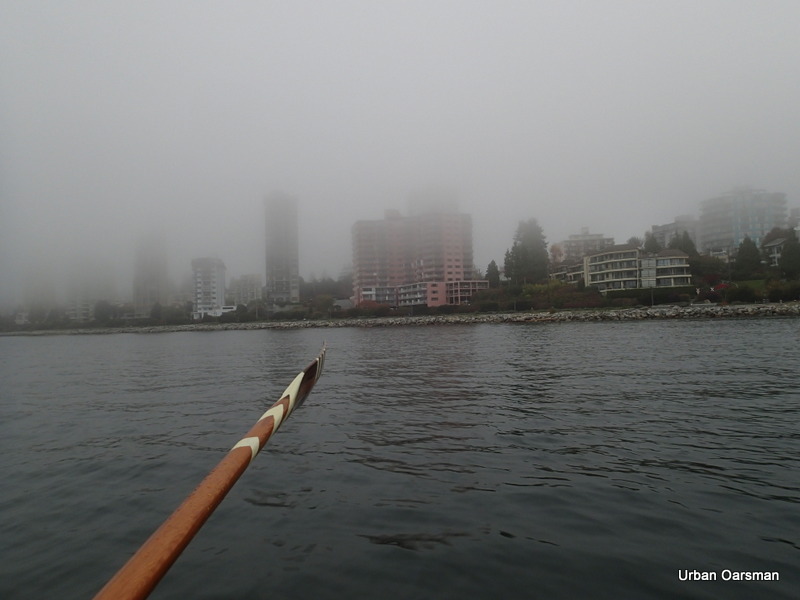 The Fog Row…Rowing from Hollyburn Sailing Club to Eagle Harbour and back in the Fog. 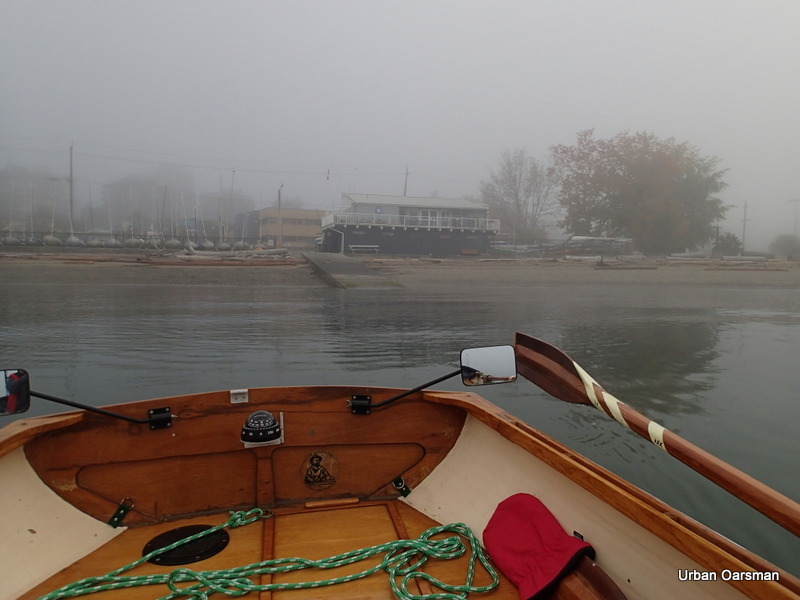 The Urban Oarsman rows from Hollyburn Sailing Club to Eagle Harbour in West Vancouver and back on a foggy day in October 2013. 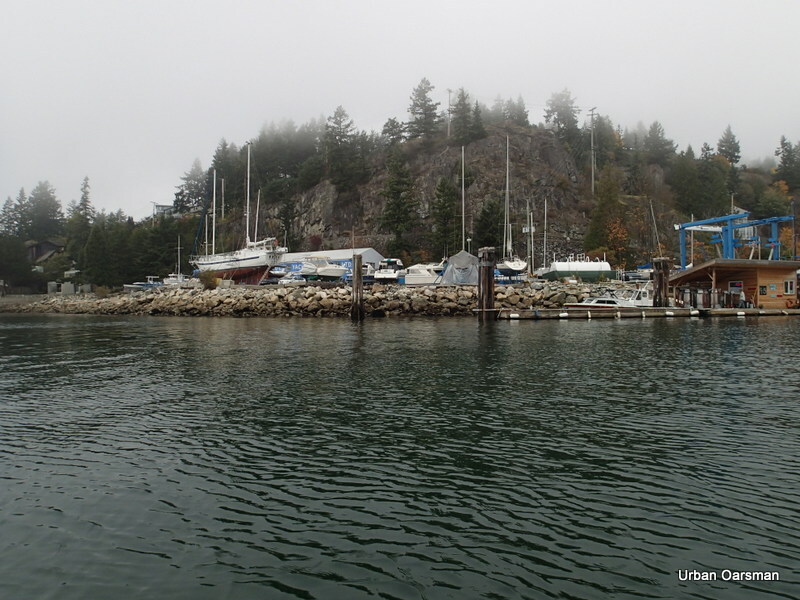 I arrive at HSC early on October 18th, 2013, rig the boat and am ready to hit the water by 9:30am. 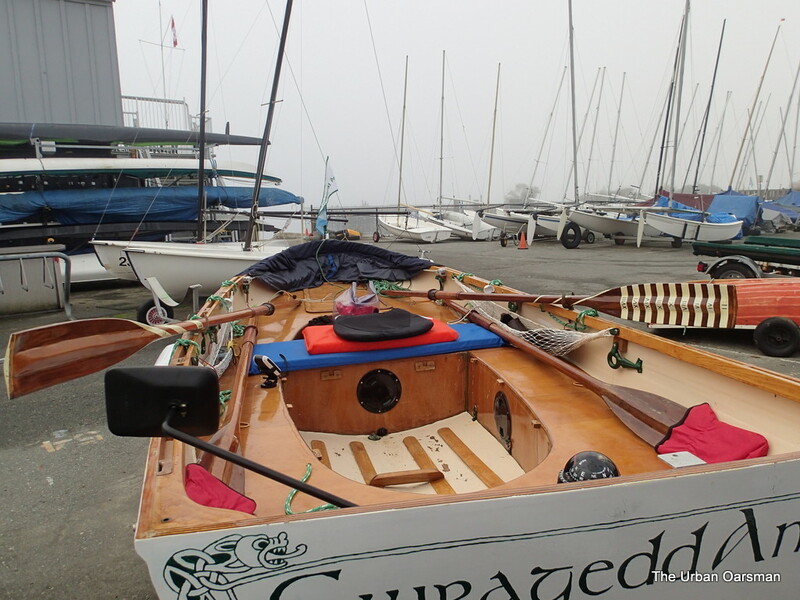 Gwragedd Annwn at HSC, leaving her space, ready to row to Eagle Harbour. Gwragedd Annwn at the top of the ramp. I have signed out in the Club’s logbook. Should anyone look, there is a record of when I left and where I expect to go. 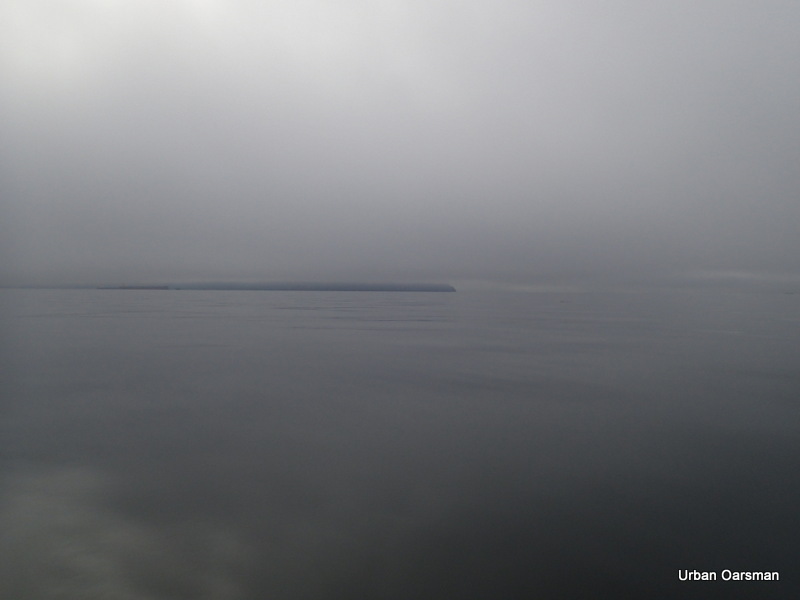 There is no wind, the water is flat. 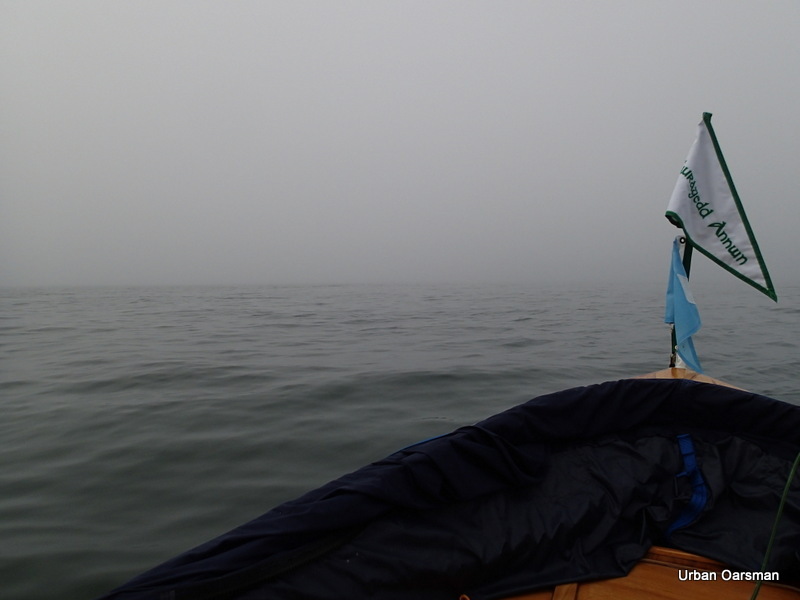 Hollyburn Sailing Club slowly vanishes into the fog astern of Gwragedd Annwn. 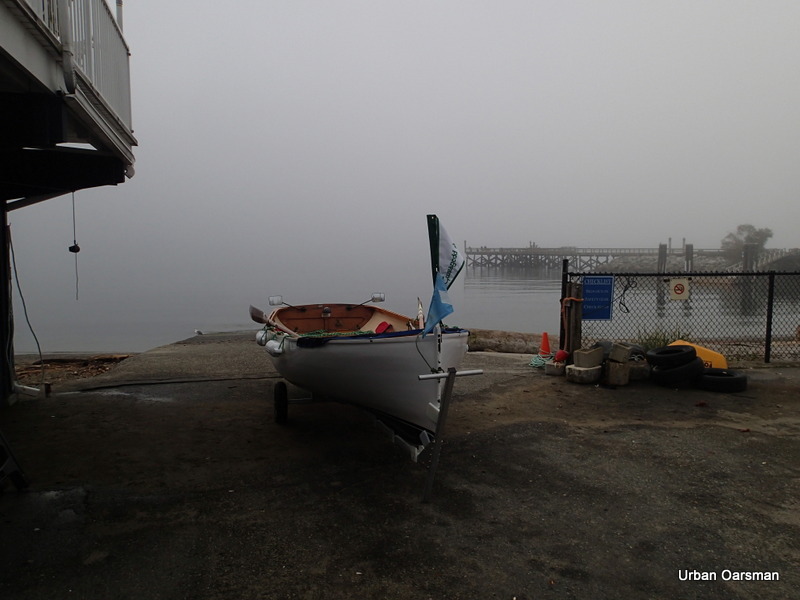 I will head out from the club, go past the fishing pier and head West for Point Atkinson. As I have my GPS unit, I do not have to keep insight of the shoreline. 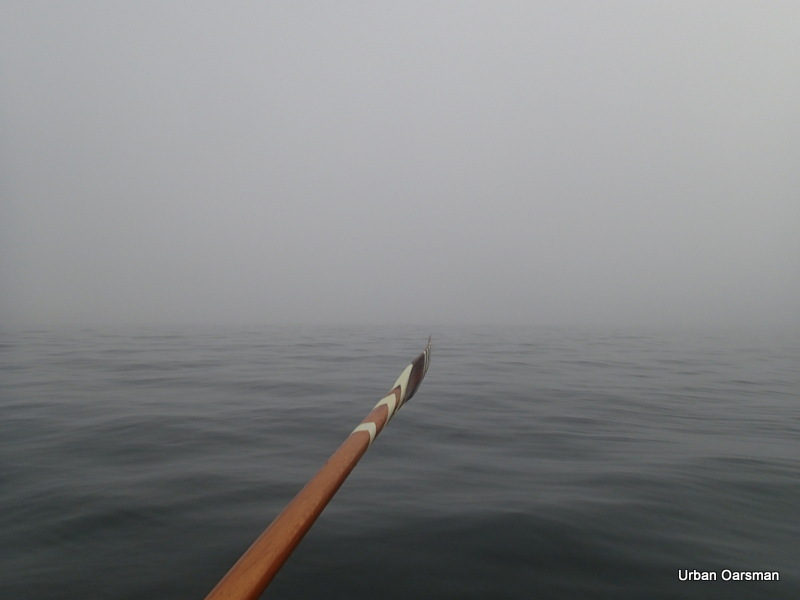 Not much to see looking South into the fog. 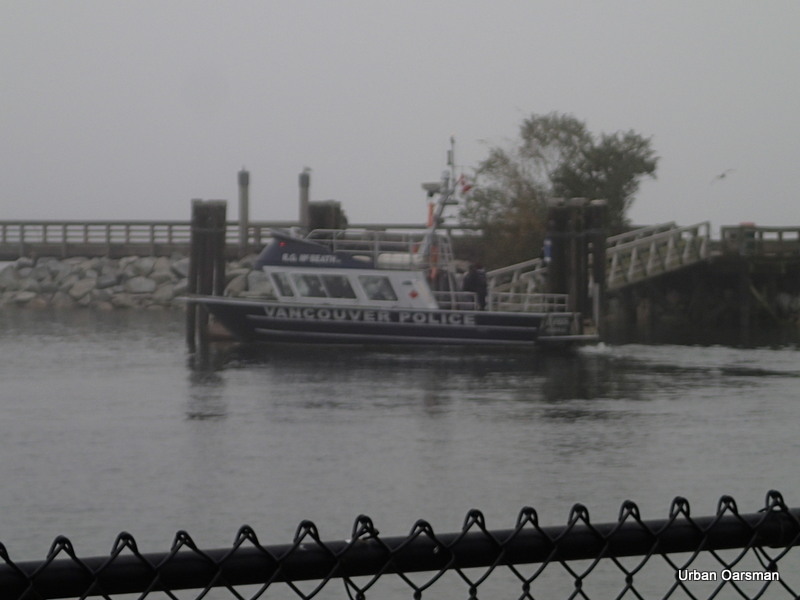 Ambleside Park vanishes into the fog. 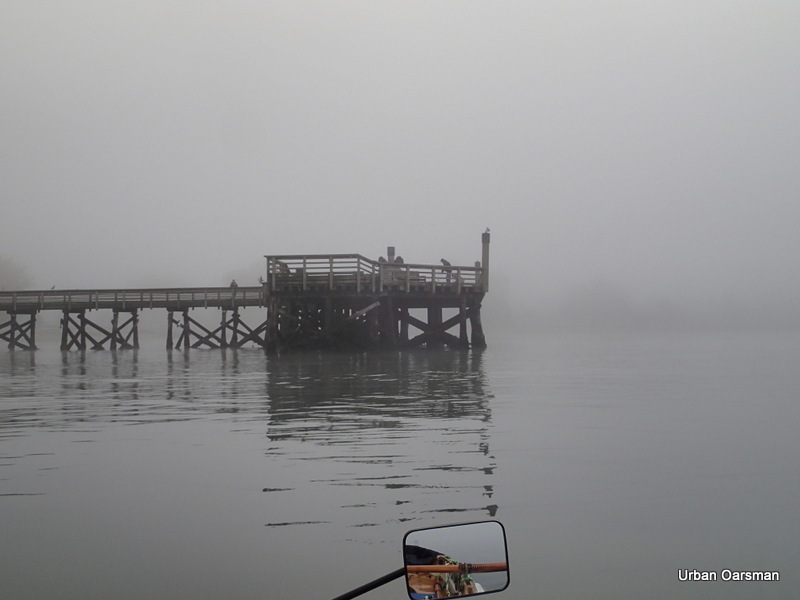 Ambleside Park has faded into the fog and the Fishing Pier will soon fade into the fog too. 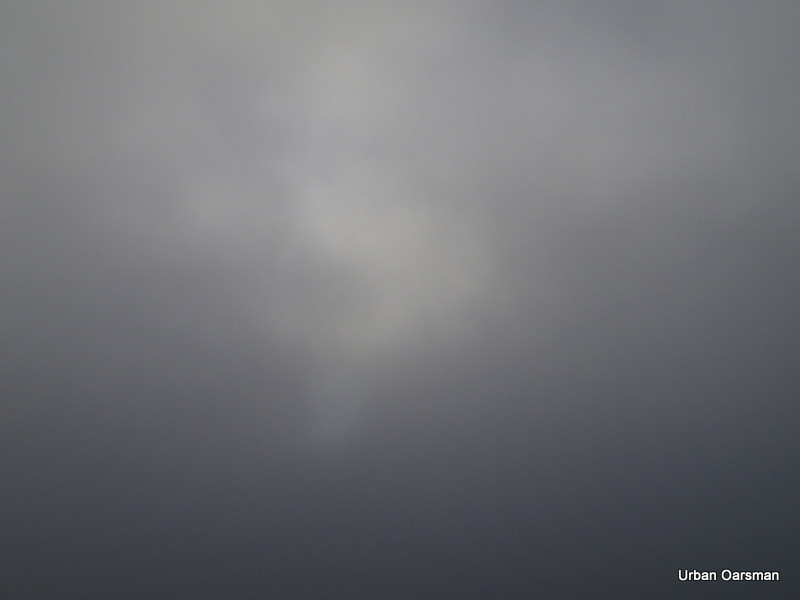 Is that the sun trying to burn through the fog? 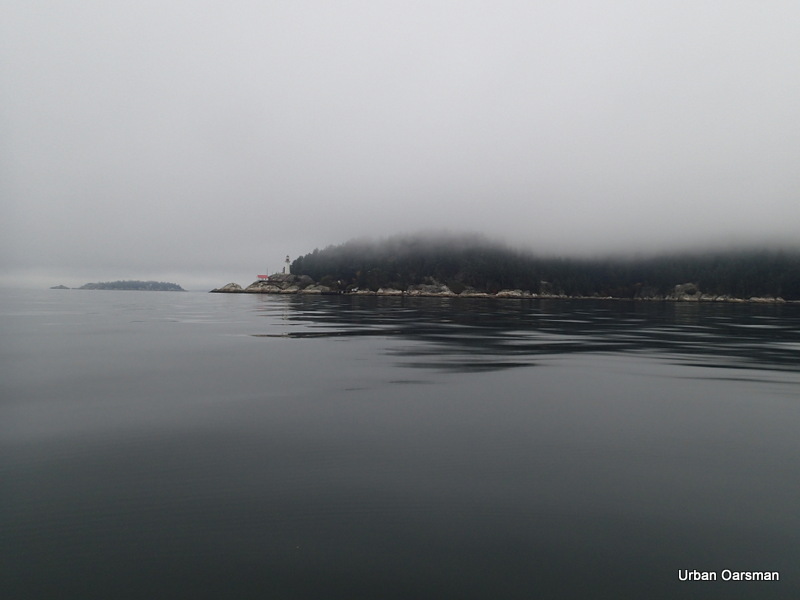 This view is looking North at the West Vancouver shoreline. Nothing to see here. Nothing to see to the South in this fog. 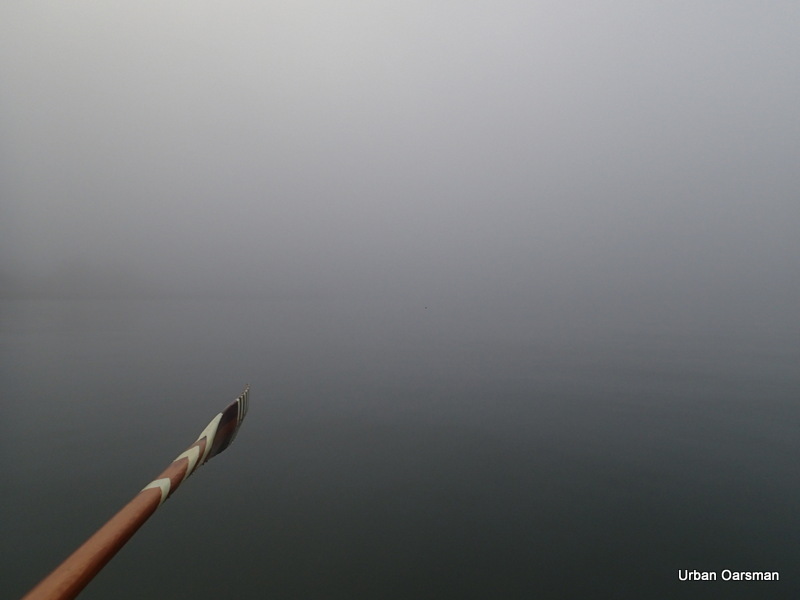 Good thing that I have my rowing compass. 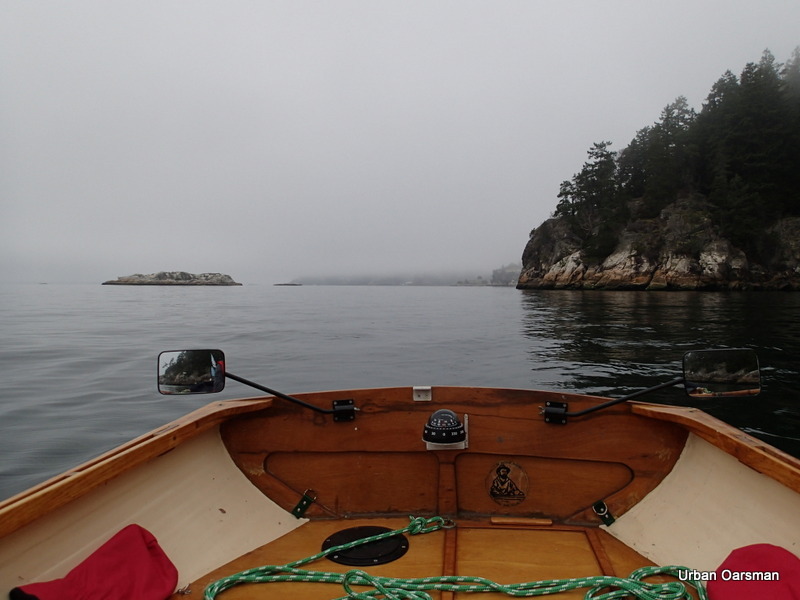 A rowing compass reads backwards, so it tells you the direction that you are heading in. Drifting with the outing tide. 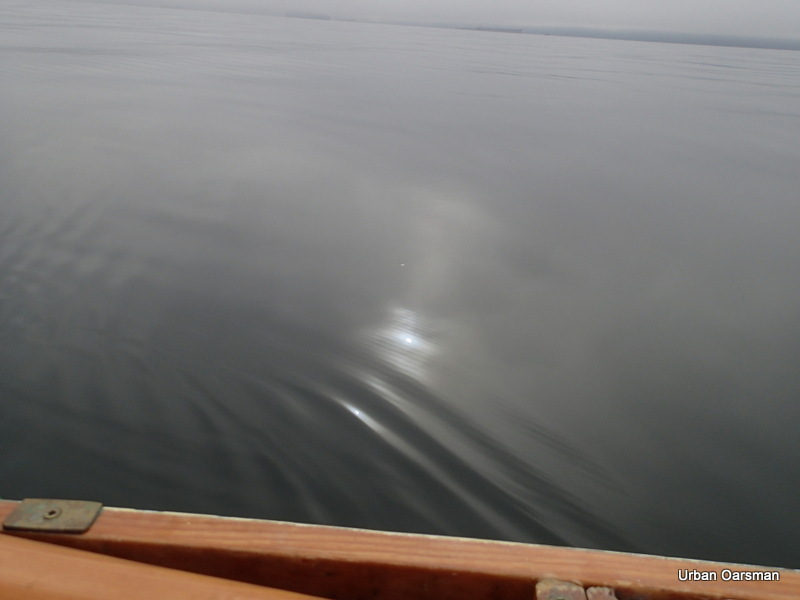 The rowing compass reads South, the direction that Gwragedd Annwn is pointing. 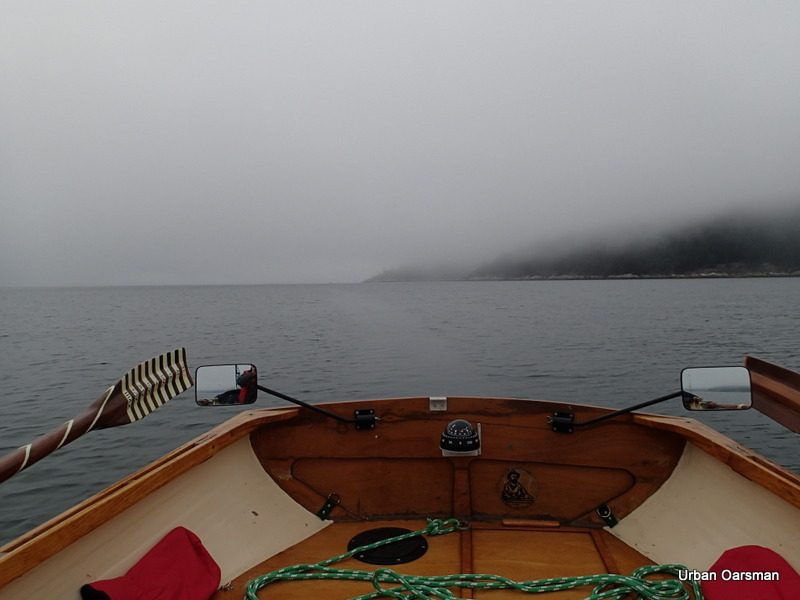 The direction that I am looking over the transom is North. Hence the direction read off the compass is the direction that I am heading in. 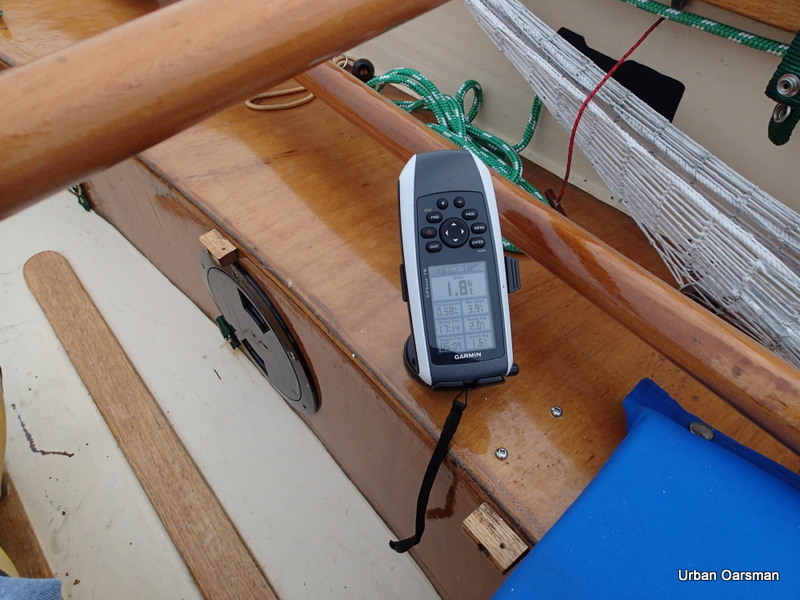 The GPS shows a 1.8 knot tide. 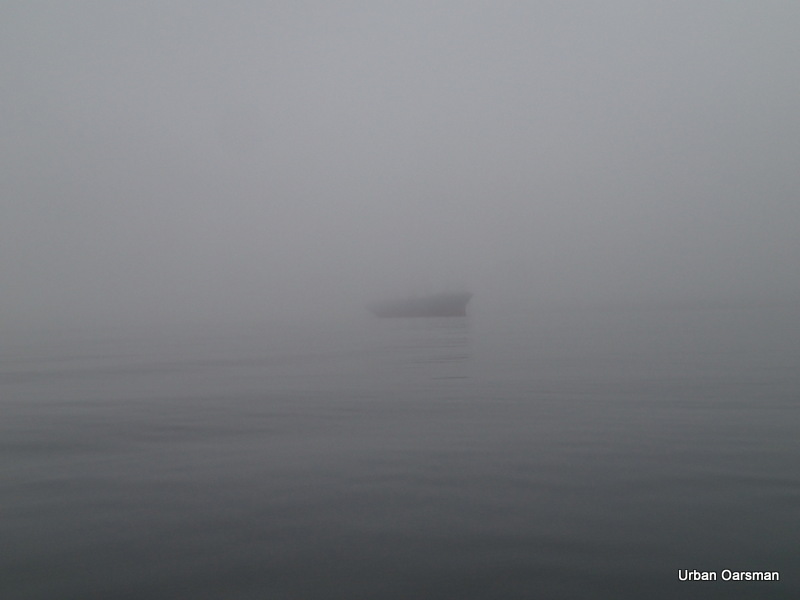 With the calm and the fog, you do not know that you are moving. Nothing to see looking West. Right down on the deck the visibility in the fog is quite good. 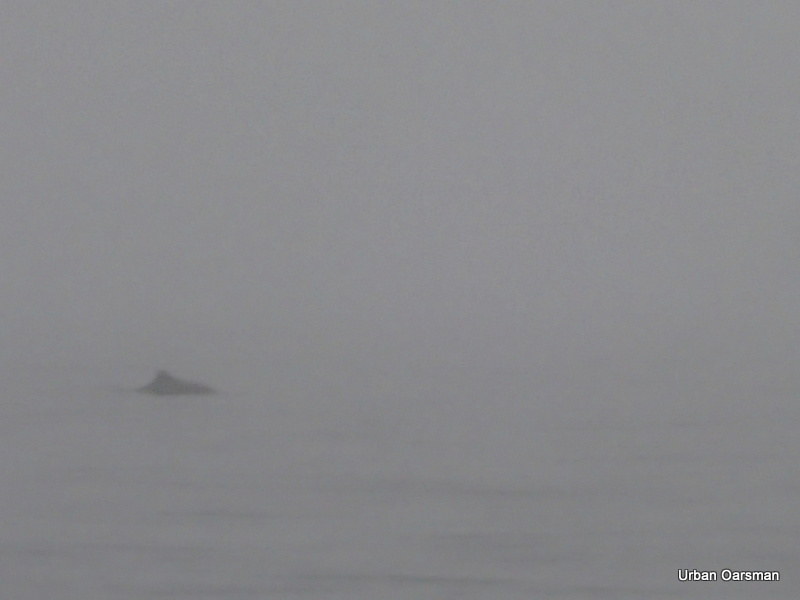 The fog does not seem to come right down to the water’s surface. 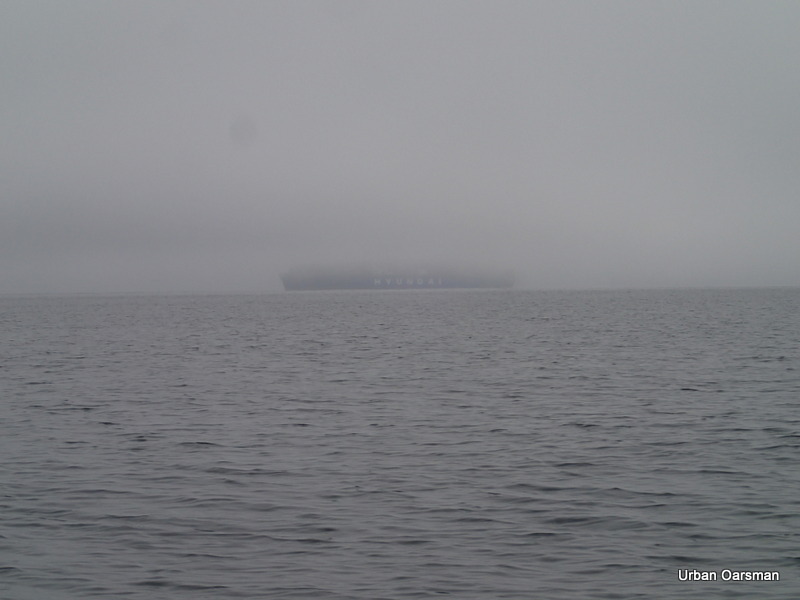 The fog seems to be twenty or thirty feet above the ocean’s surface. 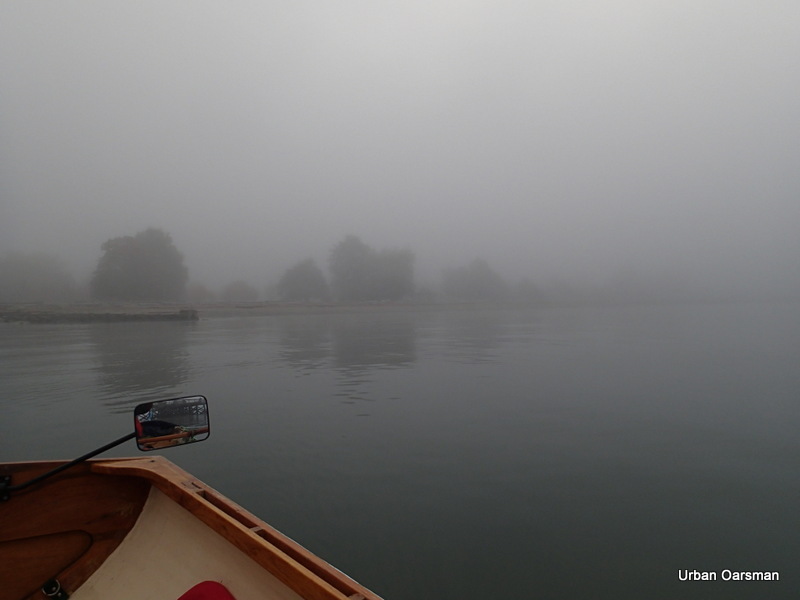 Good thing that I have my rowing compass so I can stay on course. 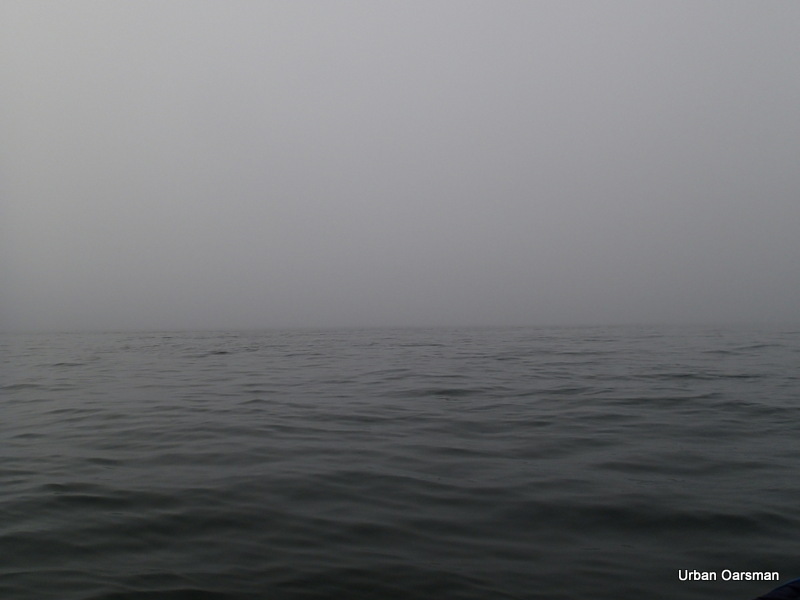 The water and the fog seem to become one in the distance. The sun is trying to peek through again. Dolphins pass by me heading into the harbour. They are almost gone by the time I get my camera. 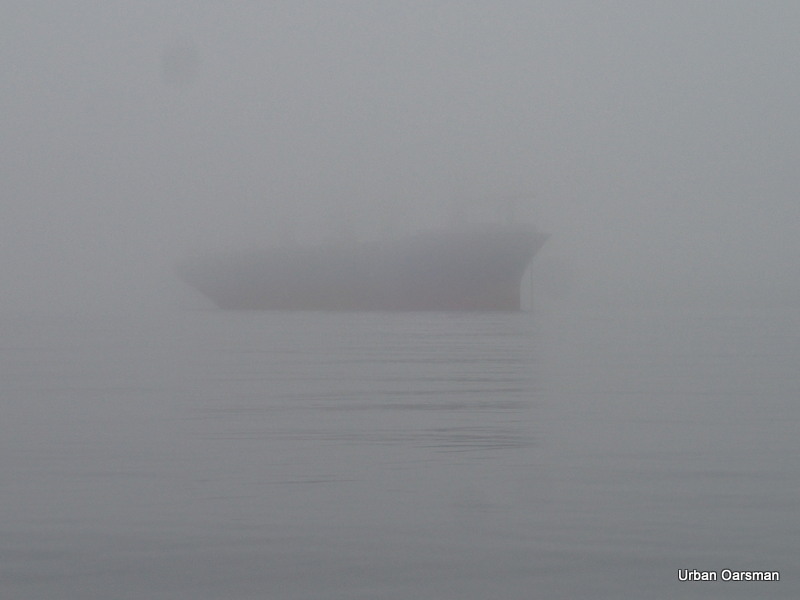 A freighter at anchorage #14 looms out of the fog. As I close I begin to make out her name…A…R…I…A…N…A. “Ariana”. 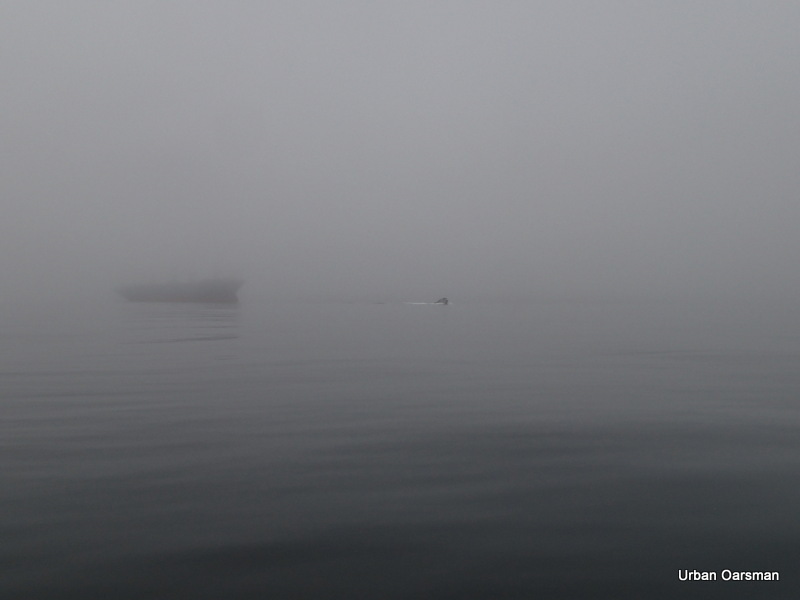 “Ariana” fades astern as the fog closes in. A Pilot boat speeds by. 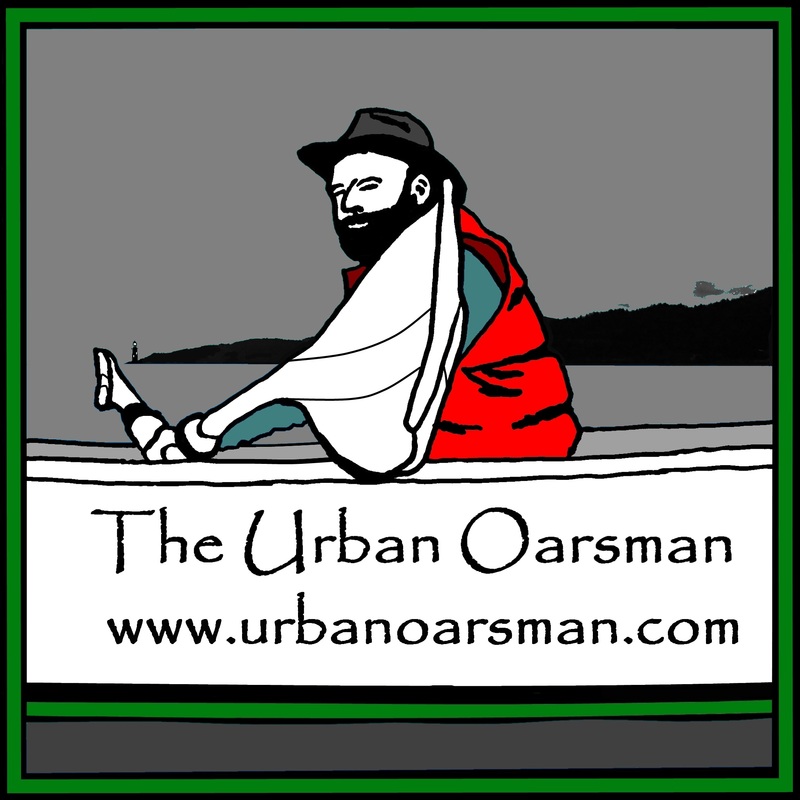 I listen to “Harbour Traffic” on channel 14. 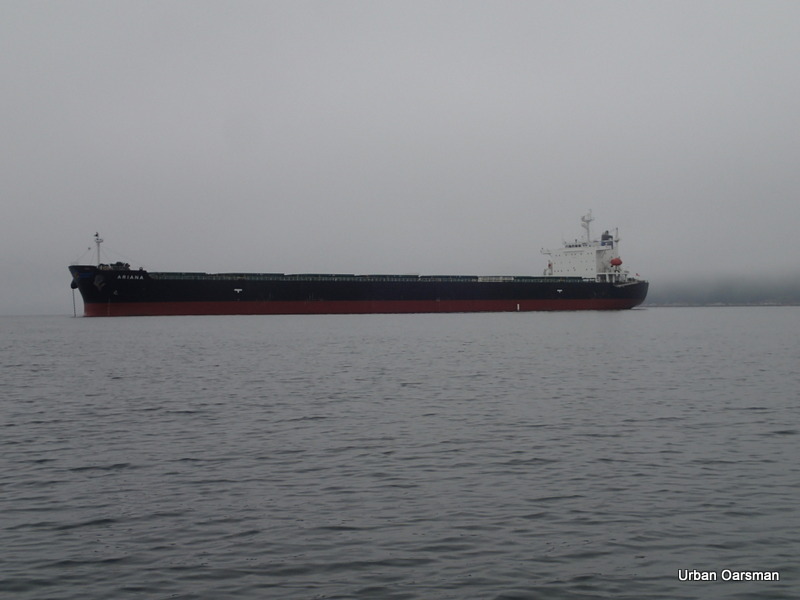 The freighter “Star Loen”, anchored at anchorage #15 is due to ship anchor and head into the inner harbour at 11:30am. 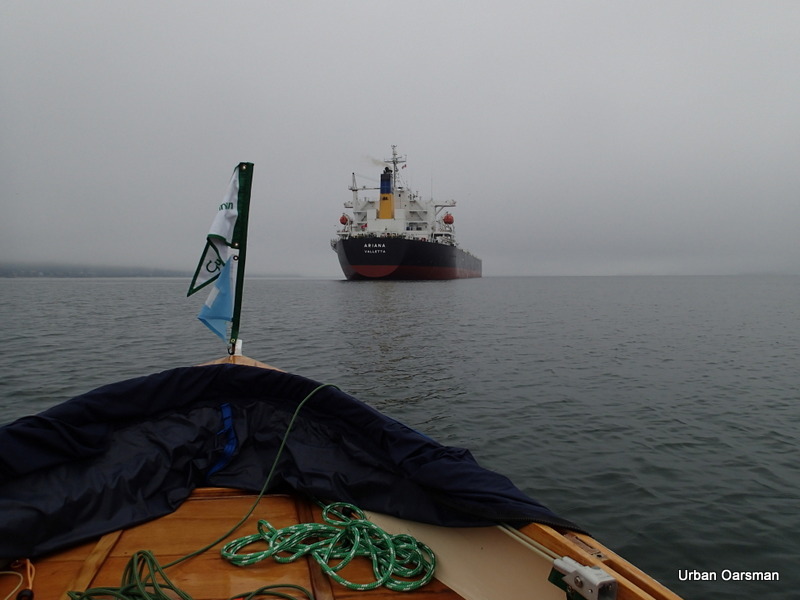 The Pilot boat is delivering the Harbour Pilot to guide her in. 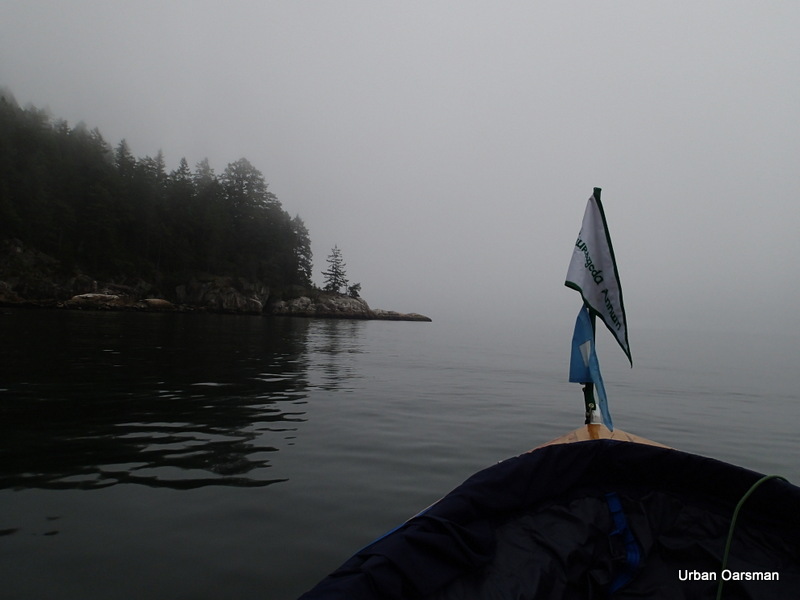 The “Star Loen” looms out of the mist as I row by Anchorage #15. 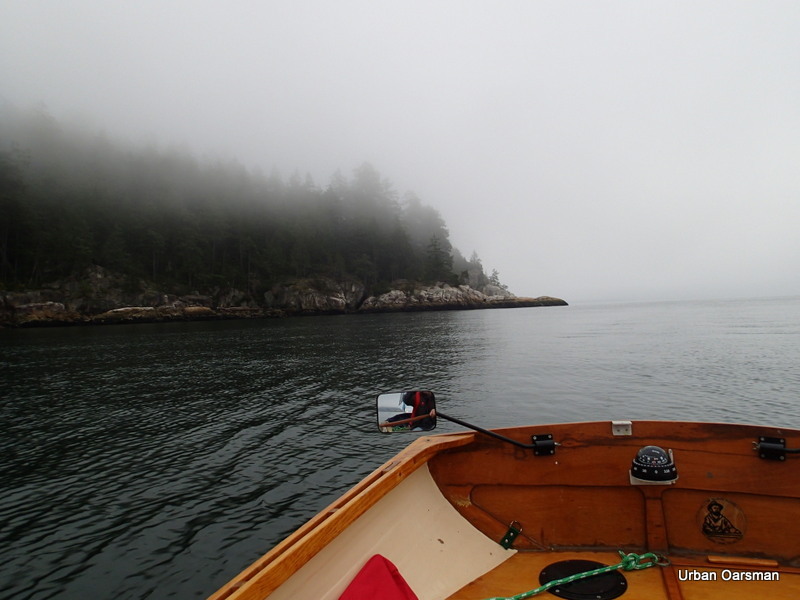 I hear the sounds of the anchor being raised as I row past from her. The fog clears a little. I leave her astern. 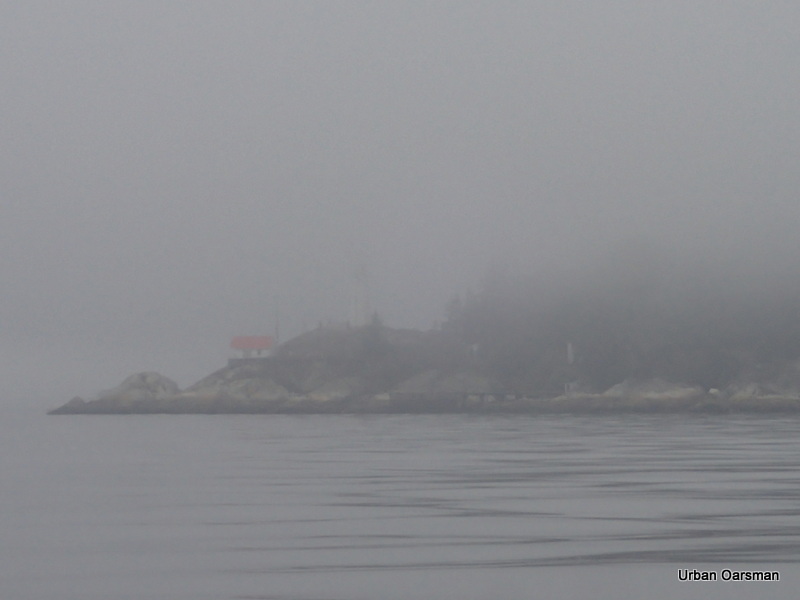 Point Atkinson Lighthouse in the fog. 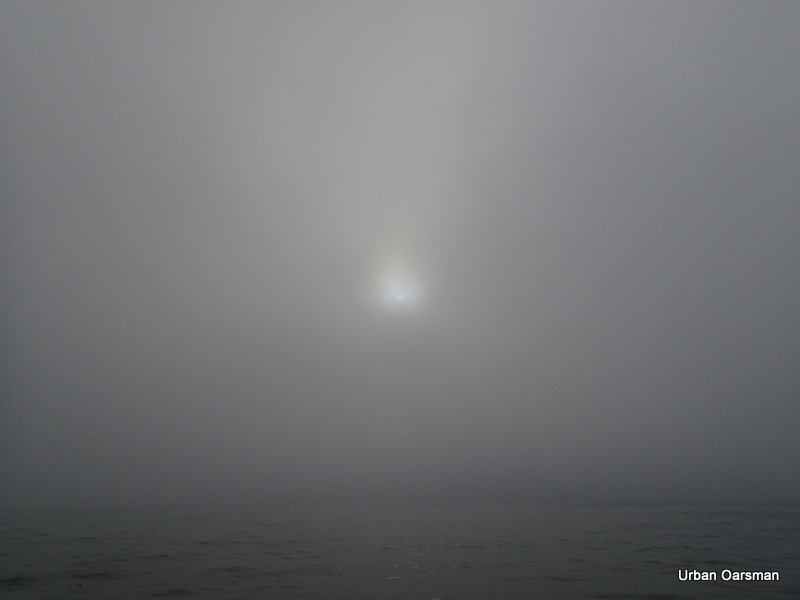 Reflection of the sun trying to burn through the fog. 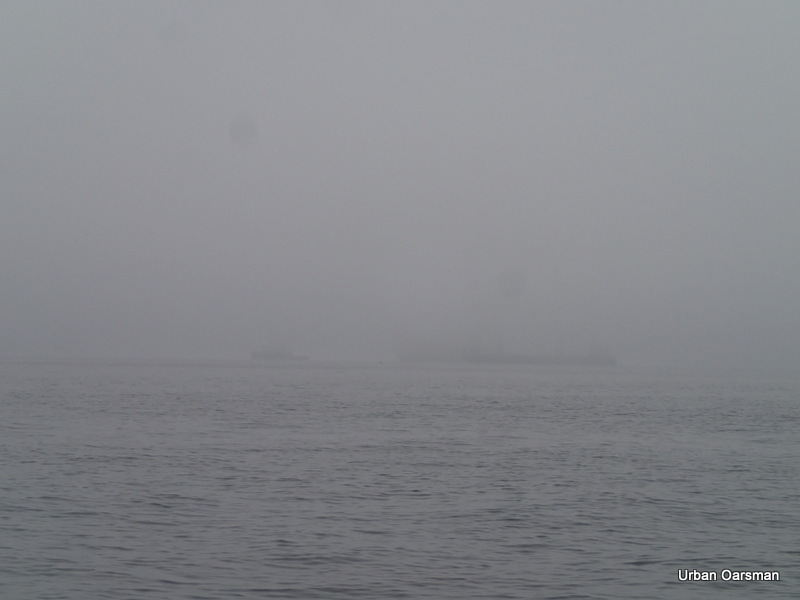 The fog lifts a little and I can see a few freighters and Point Grey across the harbour. 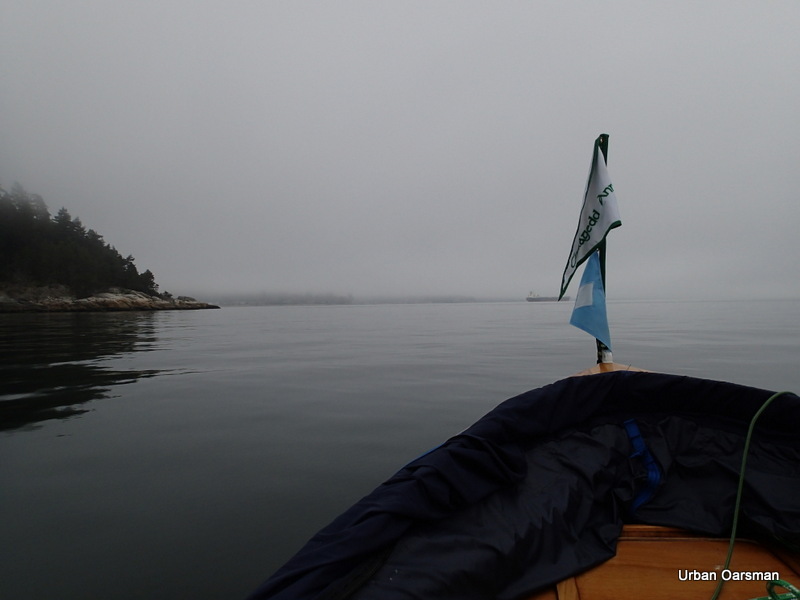 The “Star Loen” begins to get under way, heading for the inner harbour. 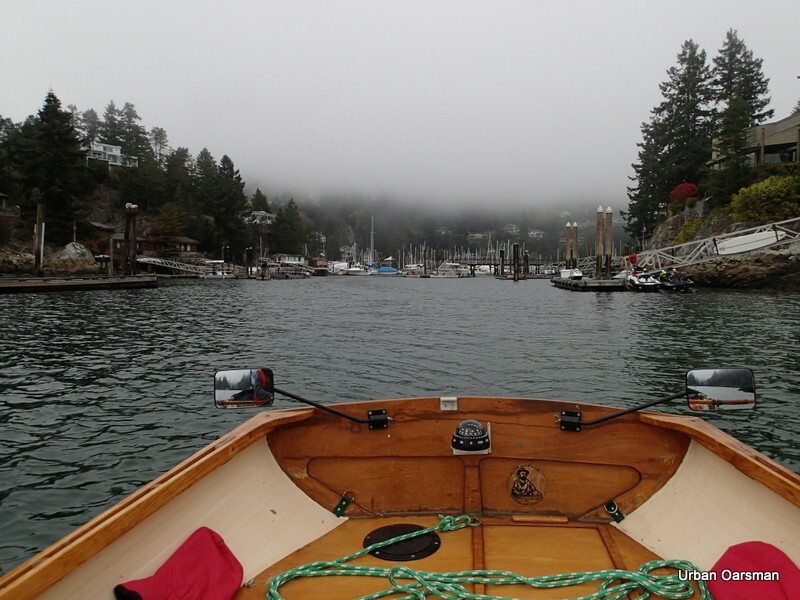 The fog is rising at Point Atkinson. With her anchor up. the “Star Loen” slowly heads into the Inner Harbour. 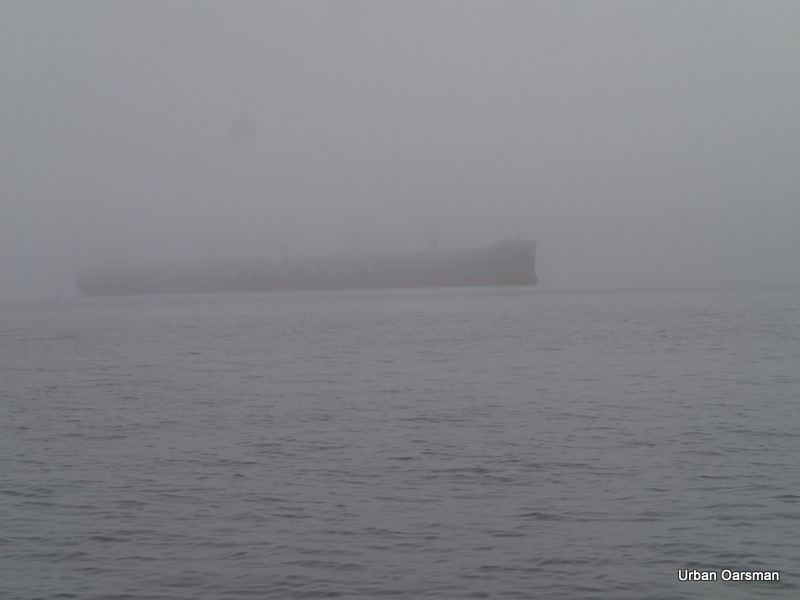 As an empty freighter heads in, a loaded freighter heads out. 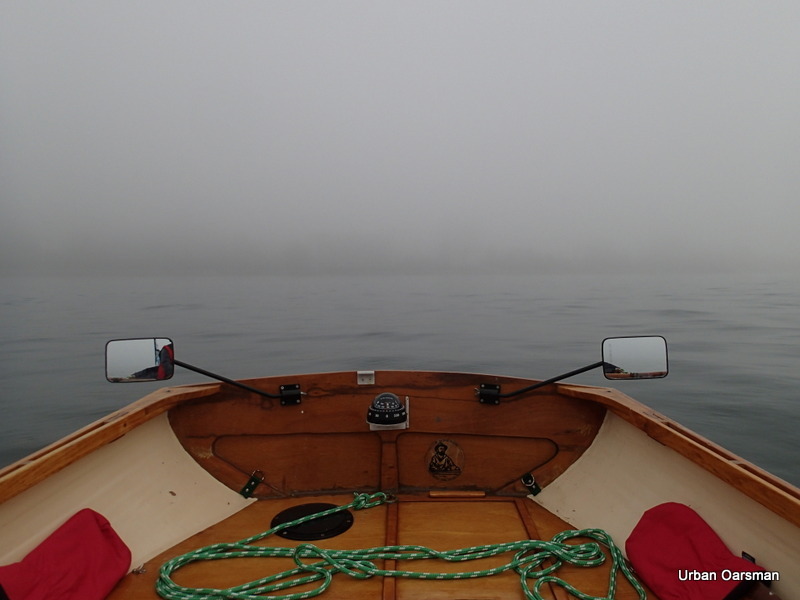 High fog or low clouds at Atkinson? 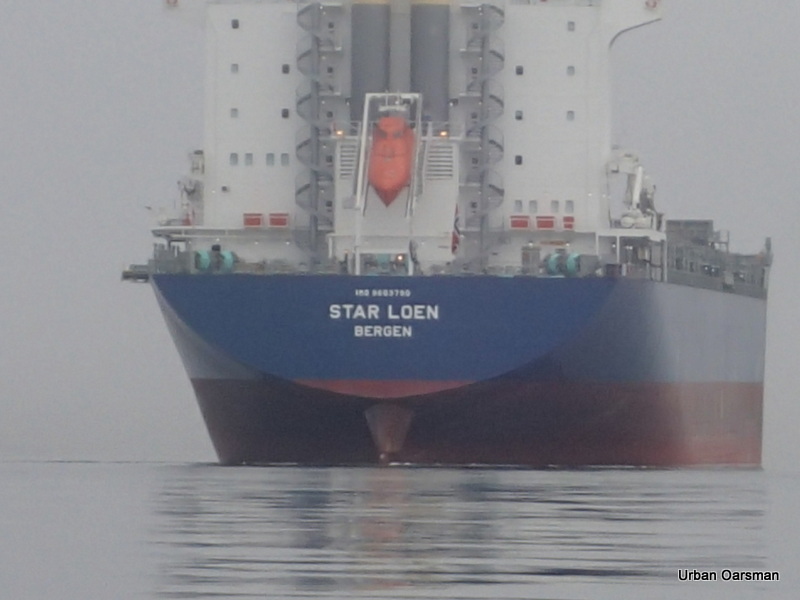 Final shot of the “Star Loen” heading in with her anchor raised. 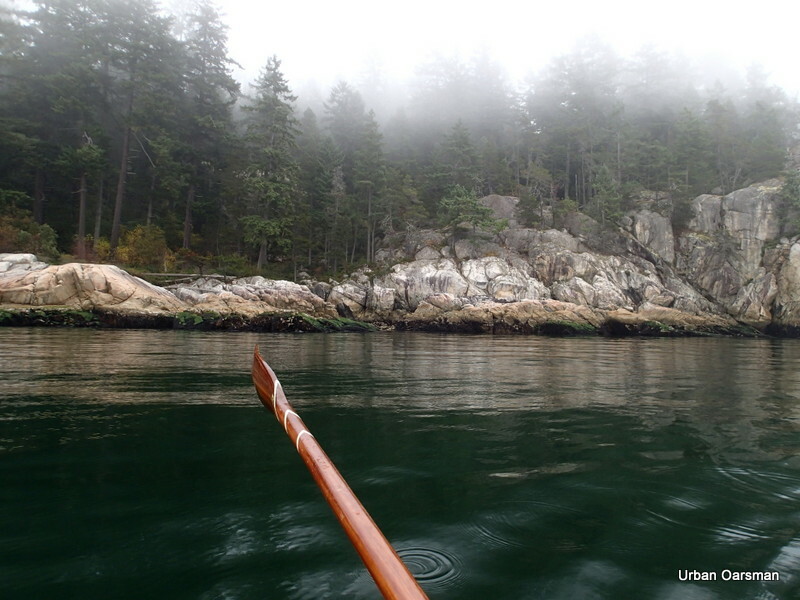 Fog in the trees as I enter Howe Sound. 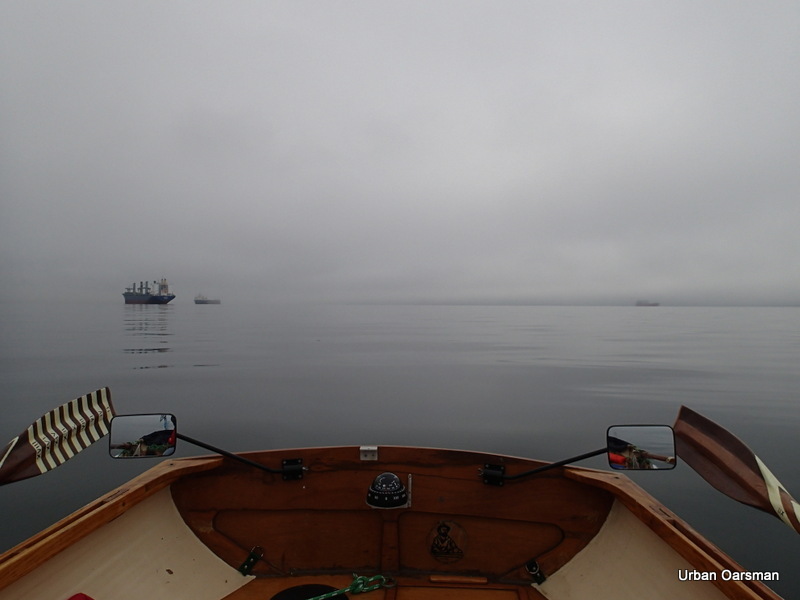 A grey day for rowing. 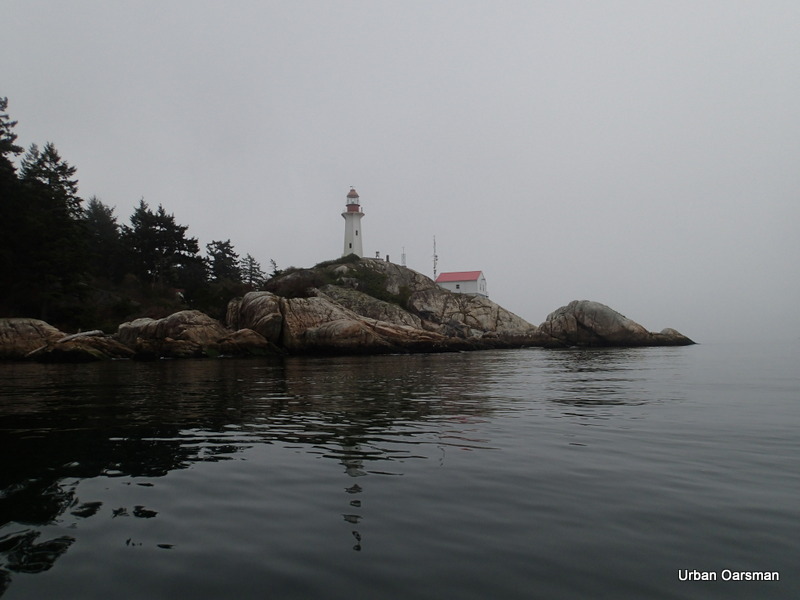 Passing Lighthouse Park heading up Howe Sound. 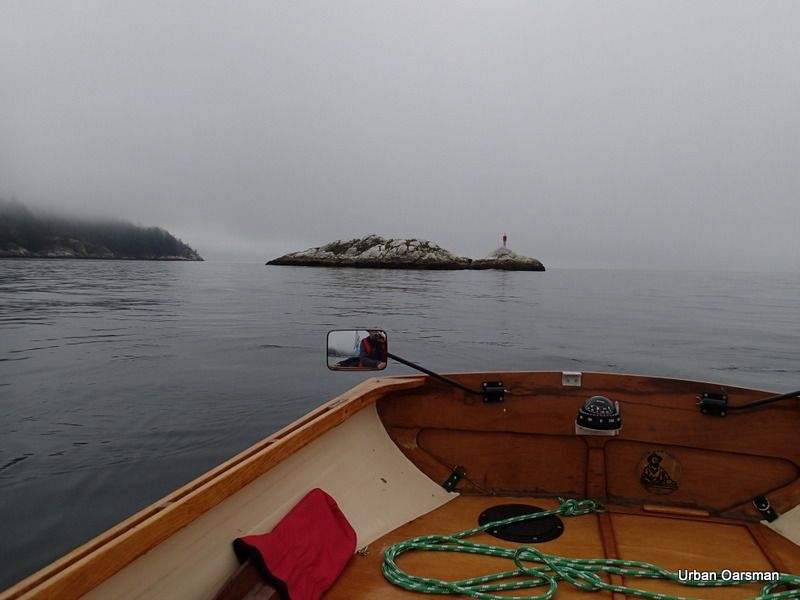 Grebe Islets in the fog. There are a lot of harbour seals here and boy can you smell them. From the aroma I would think that they eat a lot of fish… or at least a lot of fish remains come out of the other end. I stopped counting them at seventy. 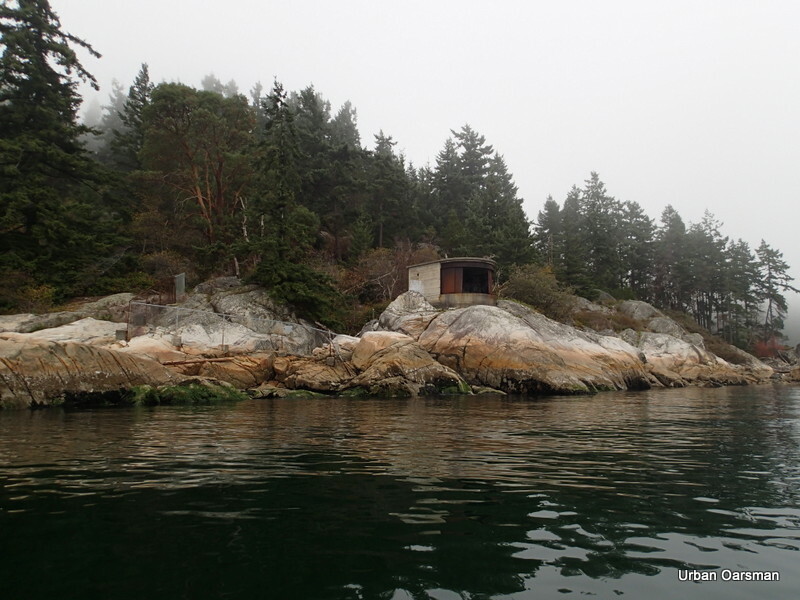 This islet rises 7 meters above the water. 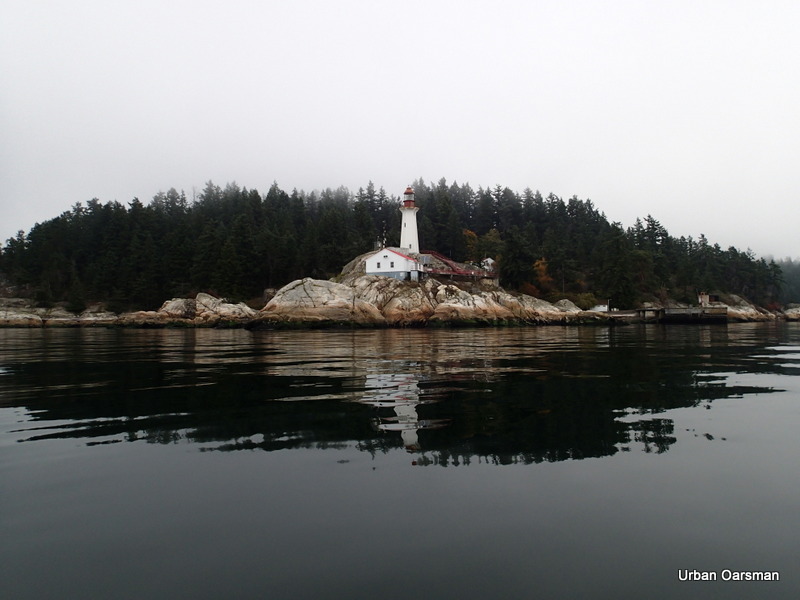 The Grebe Islet light. 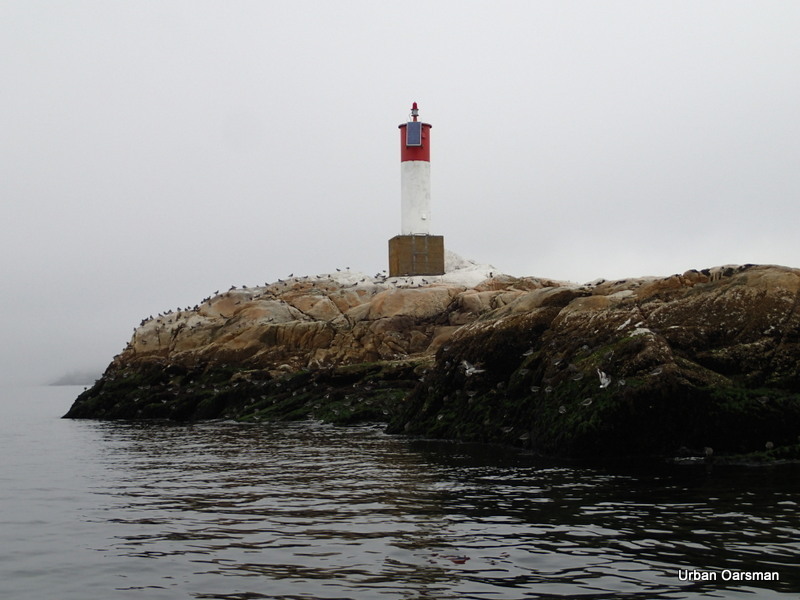 The islet was festooned with plover birds looking for food. 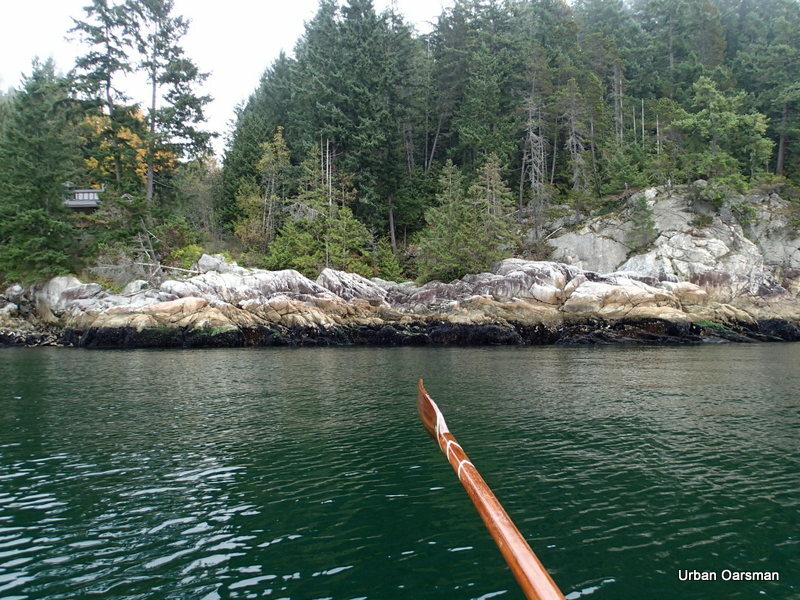 I row on, leaving Grebe Islets behind. 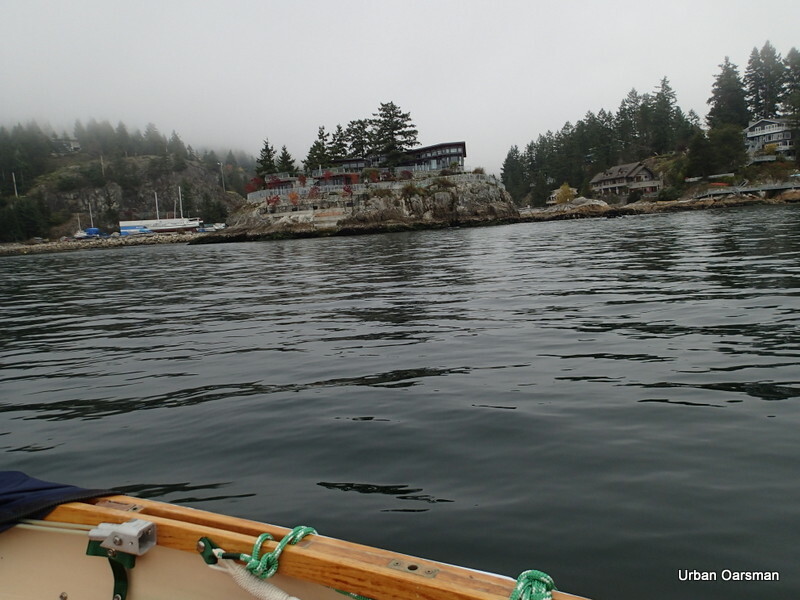 The Big House on the un-named islet West of Eagle Island. 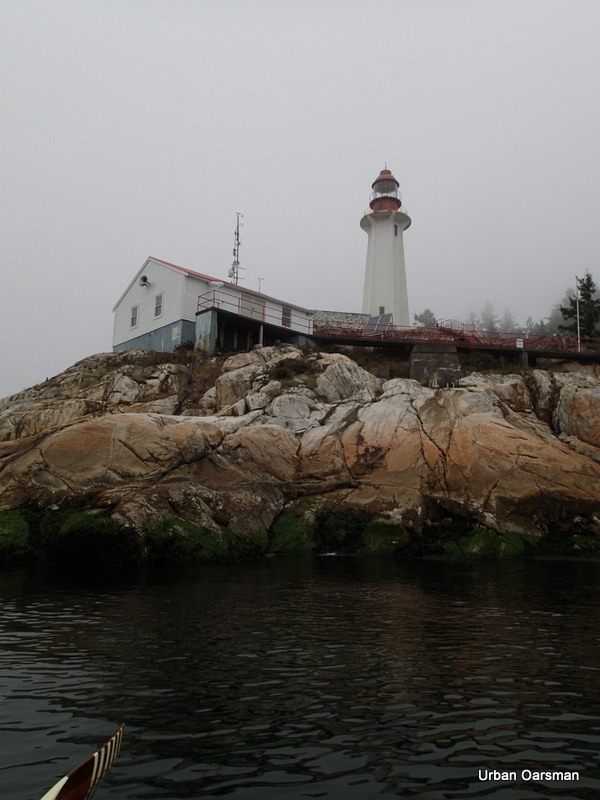 There is only one house on the Islet. 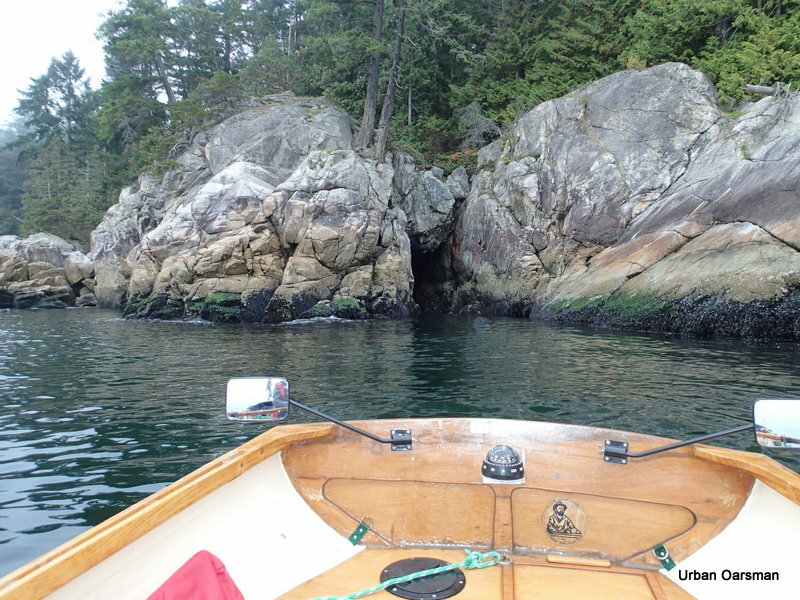 Entering Fisherman’s Cove. Race Rock Yacht Services is to the left on the shore. 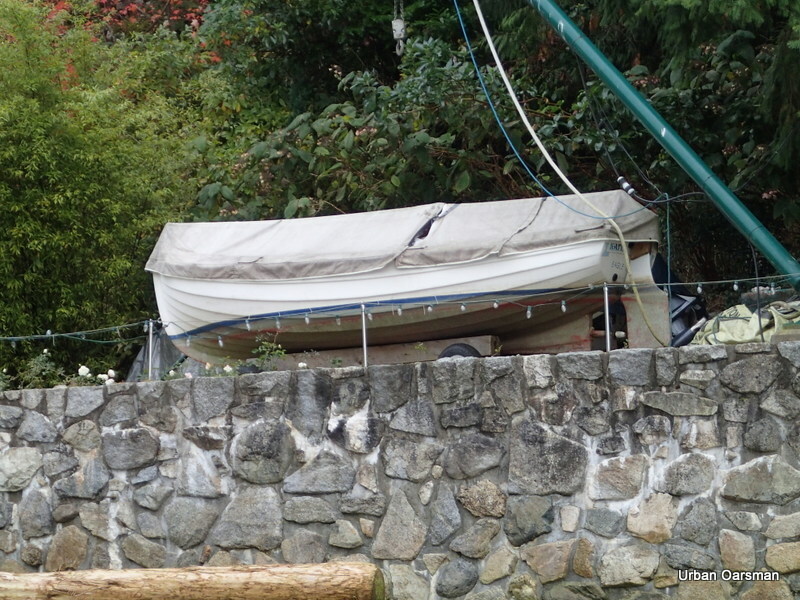 Close-up view of Race Rock Yacht Services. 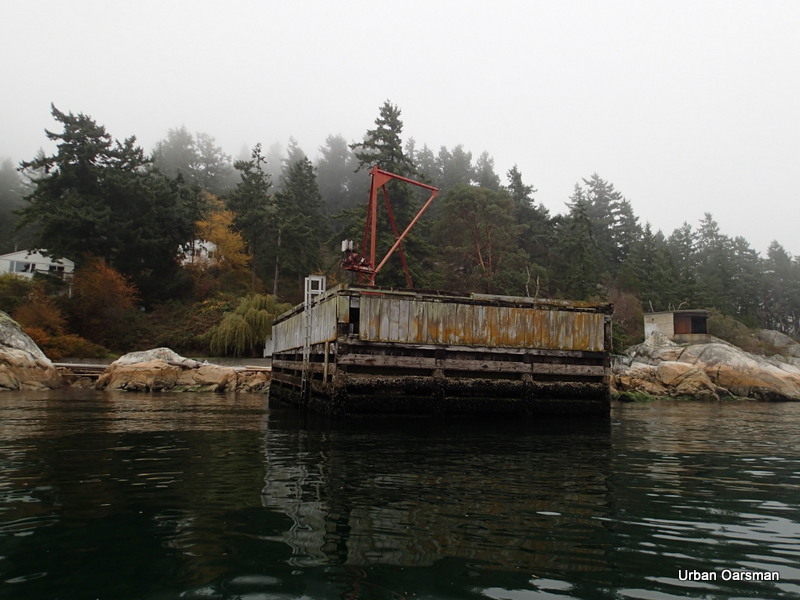 A larger clinker inboard on the shore of Eagle Island. She is named Katie Brock. The last time I saw her here was in October of 2008. 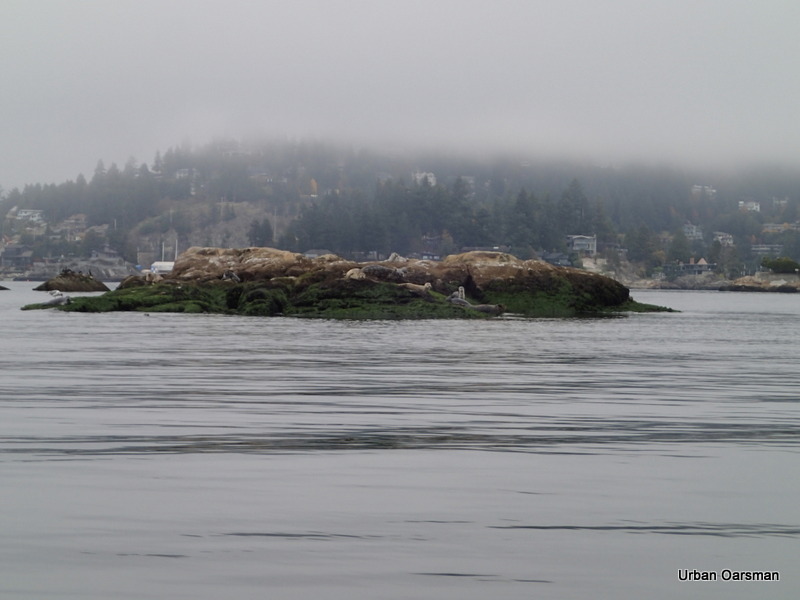 One of the “Lions Club” Orcas is on the Island. 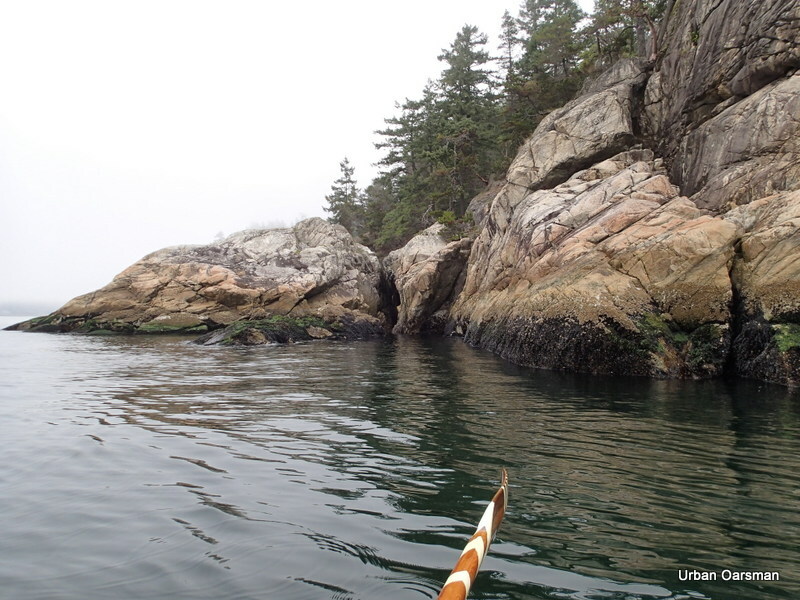 The passage between Eagle Island and the mainland. 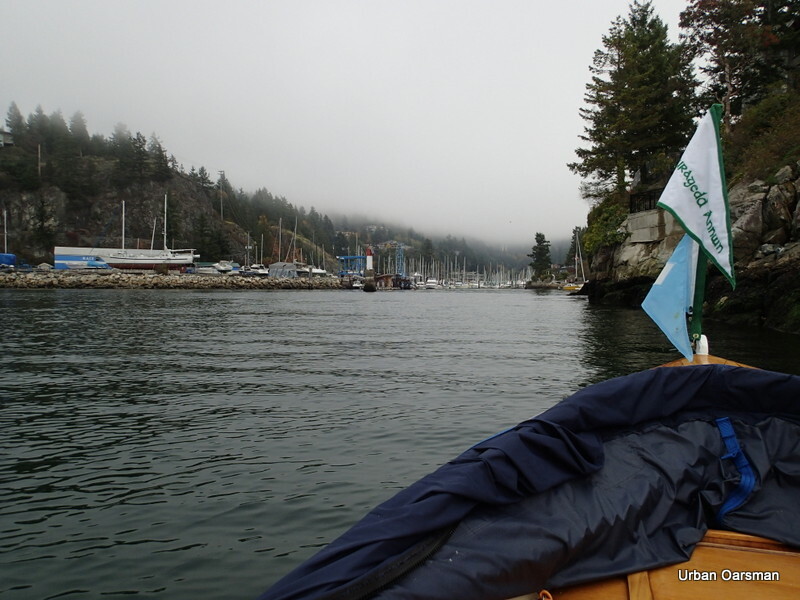 A fellow Oarsman fishing by the Eagle Harbour Yacht Club breakwater barge. 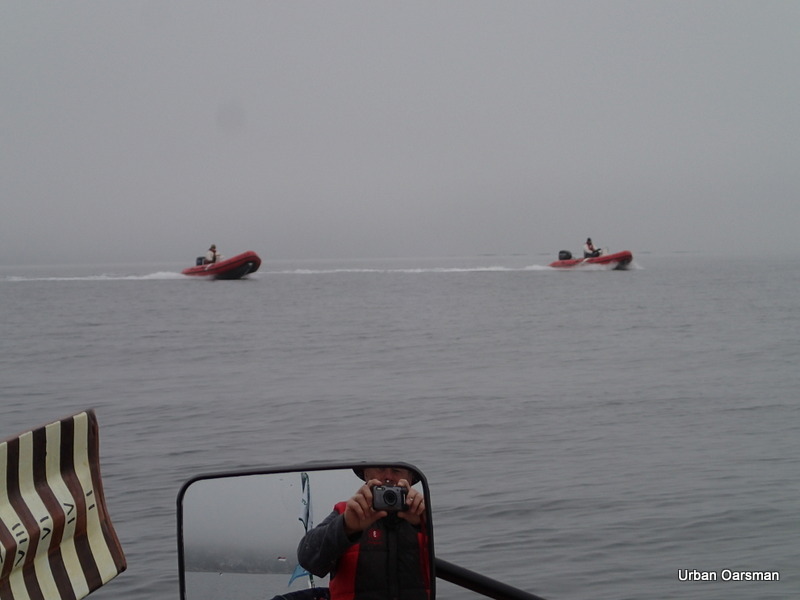 Rowing back to Point Atkinson, I leave Grebe Islets and all of their seals behind. What is this? 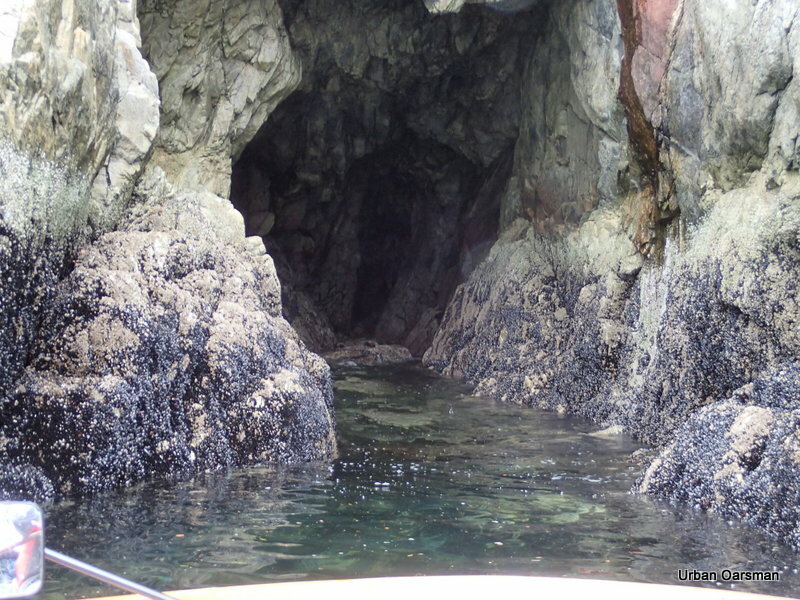 a passage through the rock to…? The channel is not wide enough for Gwragedd Annwn to enter. It does go thirty or forty feet into the cliff. Looking at the mussels, I would bet that I could row Gwragedd Annwn all the way in at high tide. I will come again, another day, at the height of the tide to try. Another chasm splits the rock. too narrow to explore much. Almost to Point Atkinson. 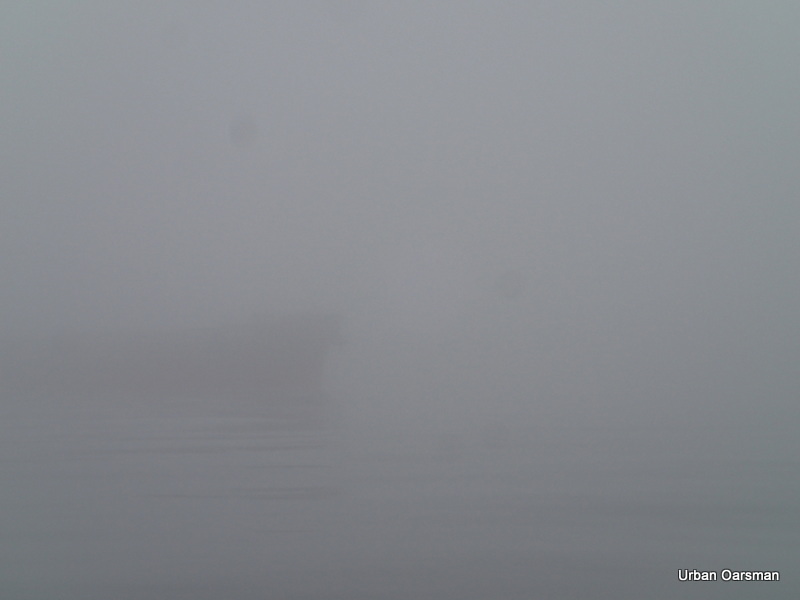 looks like the fog is still thick here. Point Atkinson on the return trip. 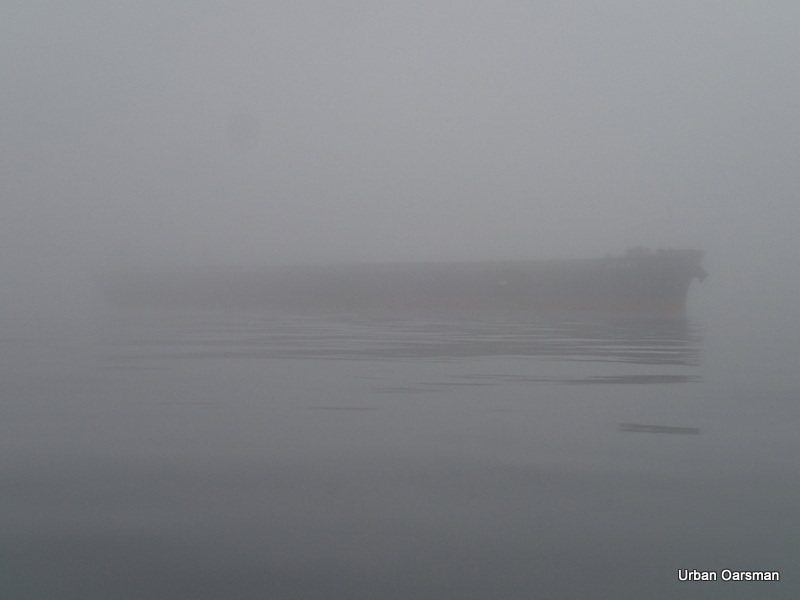 The fog is getting thicker as I enter the harbour. The supplies dock at Atkinson. Do not think that it is used anymore. 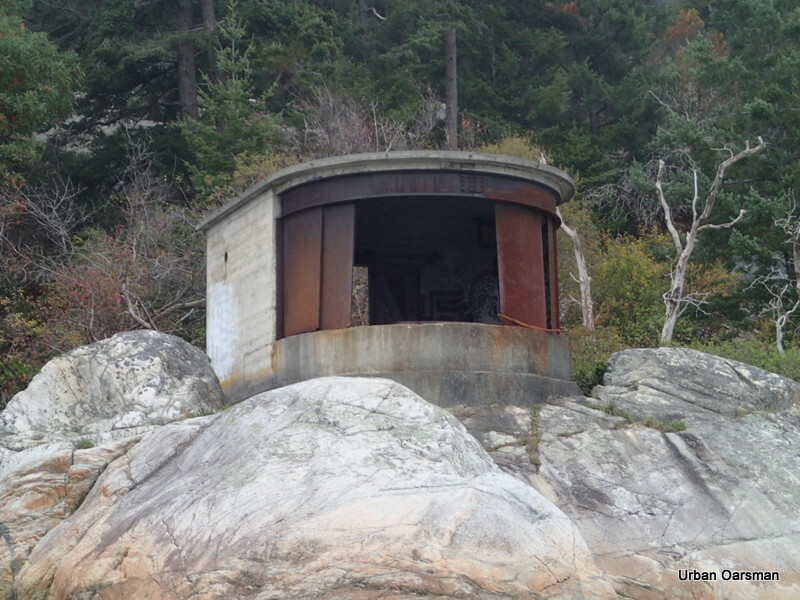 The search light bunker at Atkinson. Close-up view of the search light bunker. There are three others around English Bay just like it. One at Stanley Park by Siwash Rock and two on the beach at Point Grey. 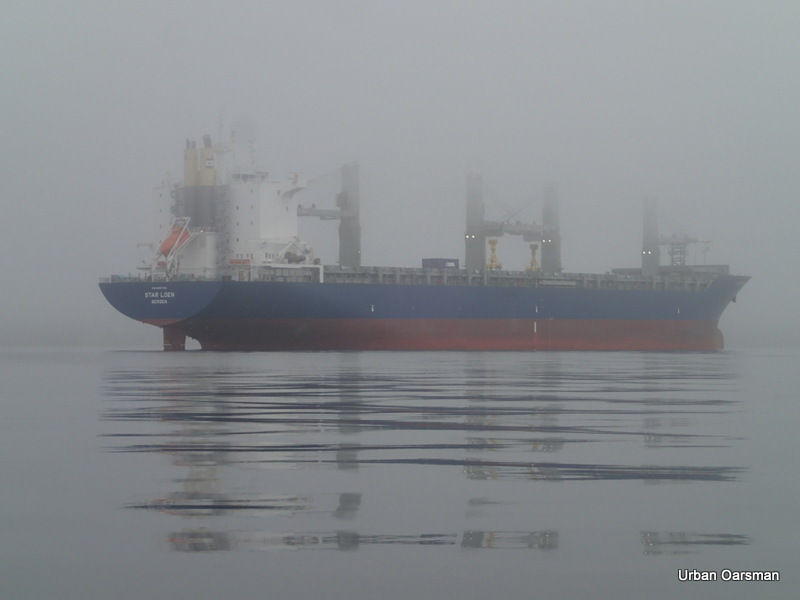 A clear view to the freighter at Anchorage #14 She is the “Ariana”. I passed her on the way out. 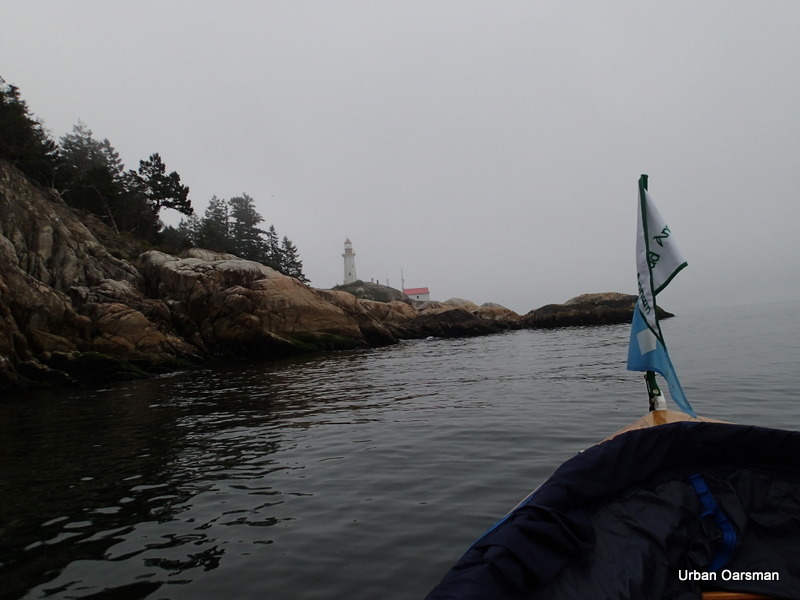 Point Atkinson is fogging in again. Gwragedd Annwn’s wake trails to the horizon. Coming up on the “Ariana”. 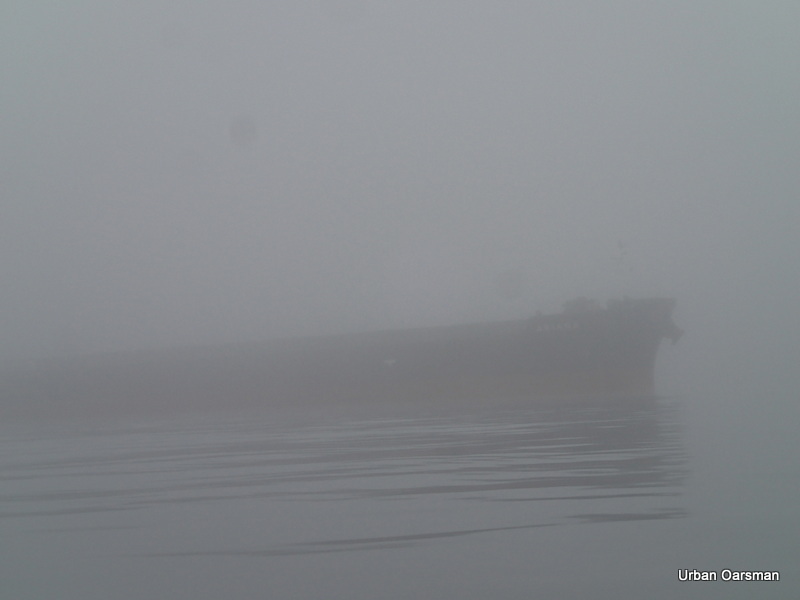 Another freighter looms out of the fog heading into the harbour. I knew that she was coming in from listening to “Harbour Traffic” on channel 14 on the VHS radio. I do not know who these guys are or where they are from. Their rubber ducks said “APSA” on the bow. The ducks are red like Coast Guard Boats, but, they did not say “Coast Guard” and the drivers were not wearing Coast Guard Gear. They just zoomed by heading West. 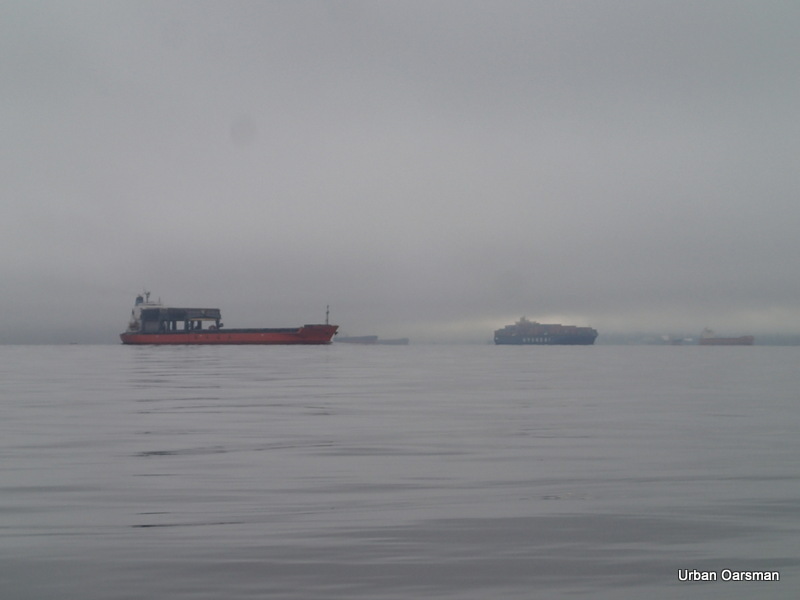 A tug and her tow enter harbour in the inbound shipping lane. 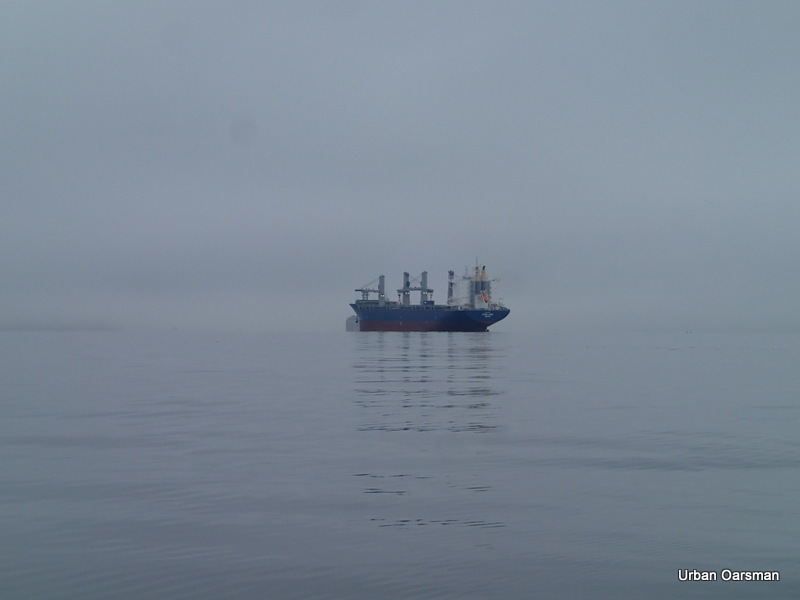 A freighter leaves the Inner Harbour, in the outbound shipping lane. 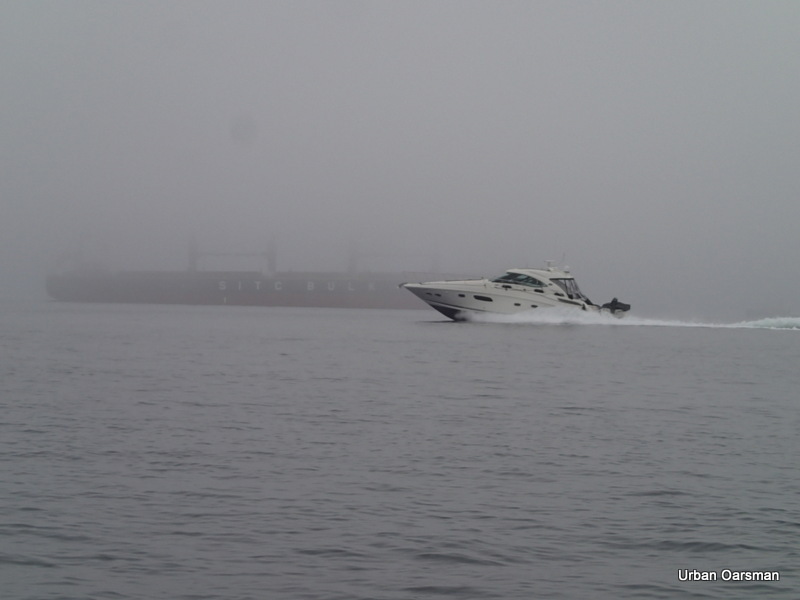 A power boat speeds by as the freighter leaves. The famous “Pink Building” in the fog. 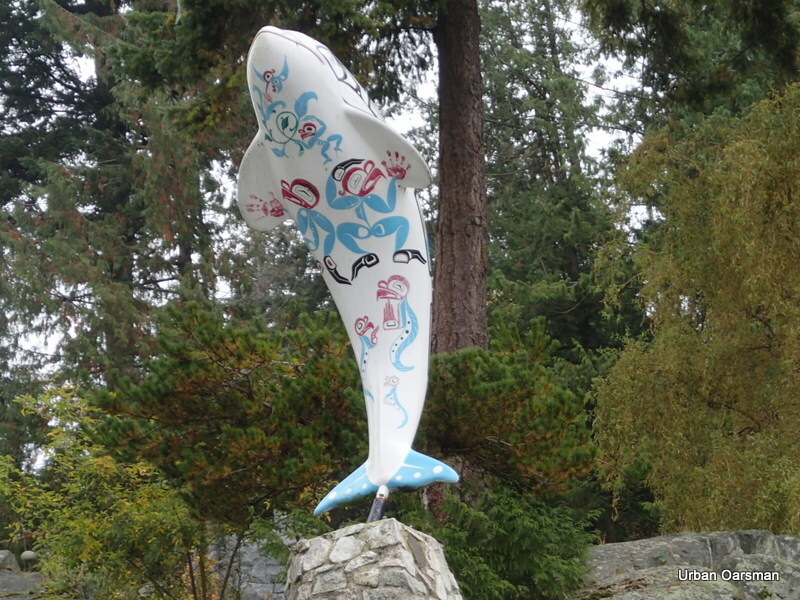 A West Vancouver Landmark. 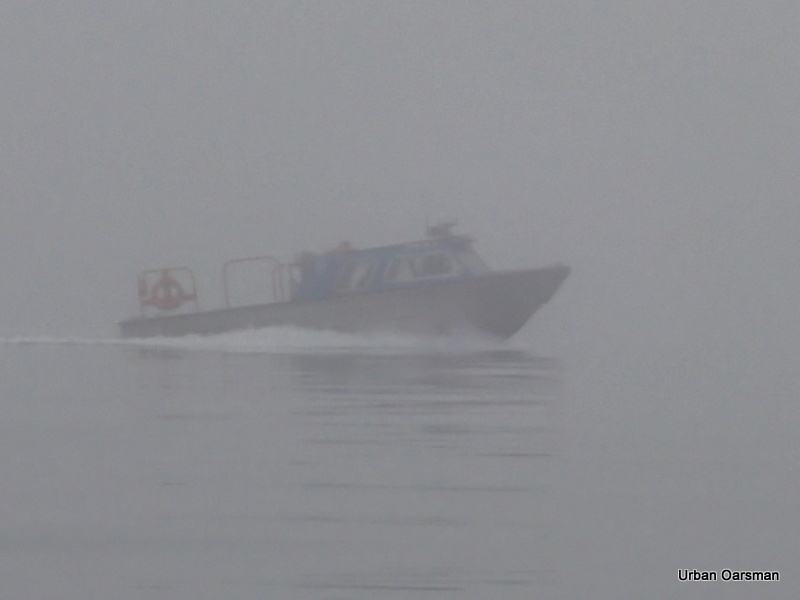 As I am derigging Gwragedd Annwn on the HSC launching ramp, the police boat appears out of the fog, heading for the Fishing Pier and the small dock attached to it. The R.G. 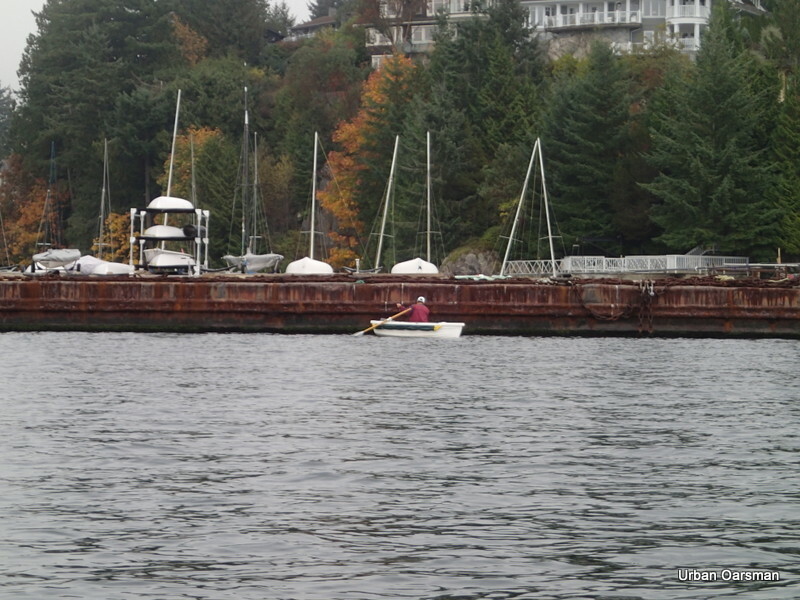 McBeath stopped by the floating dock and some people came down and did some filming with her in the background. Just another day on Patrol, I guess. 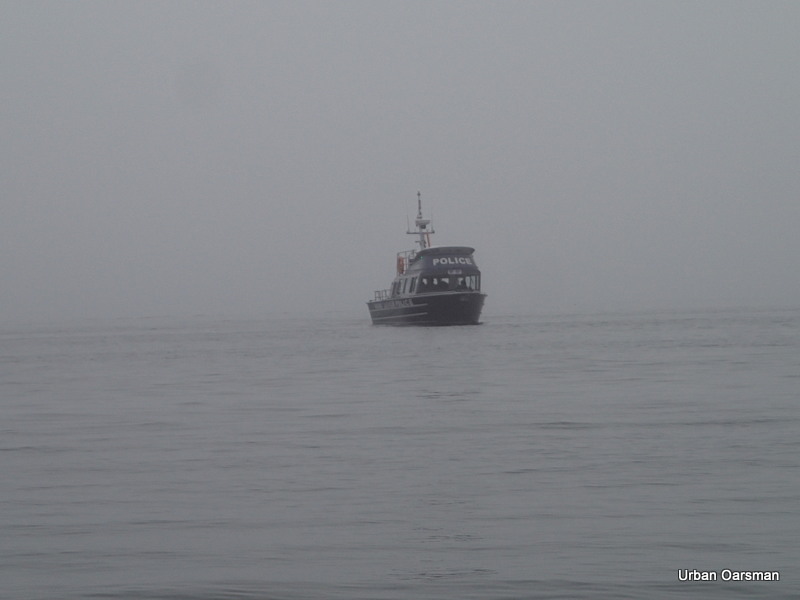 She then vanished southbound into the fog. I finish derigging Gwragedd Annwn, put on her cover and put her back into her spot. 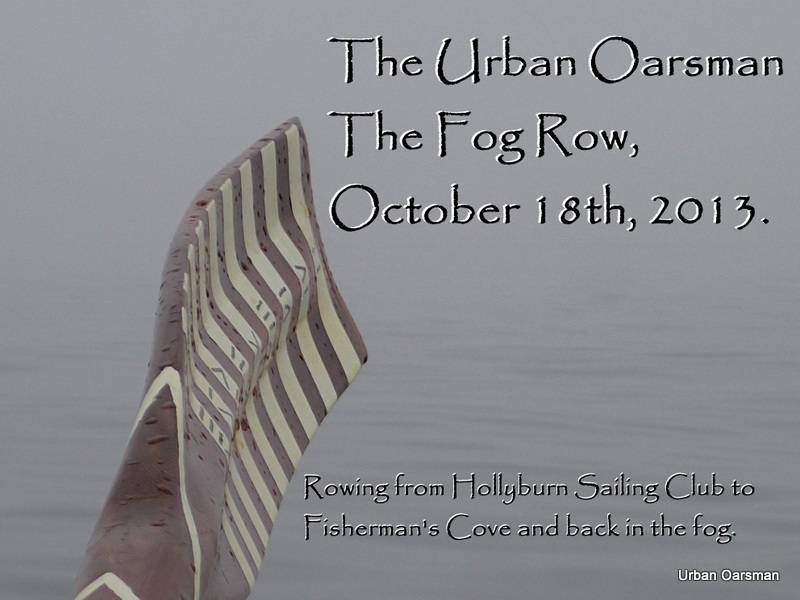 The Urban Oarsman…The Fog Row.